Having gone as far westwards as it’s possible to go without getting our feet wet, we are continuing our trek southwards in a new direction and this new blog entry. The westwards trek blog is still available here. A completely photo-free day today. Retuning from Steep Point, the weather has retuned to it’s blue sky-ness and we called in to the stromatolites again, judging that it would be high tide and they would be in more of their natural habitat, but actually judging it completely wrong. The tide was even further out than our previous visit, and it was a bit cloudy so no photo ops there. 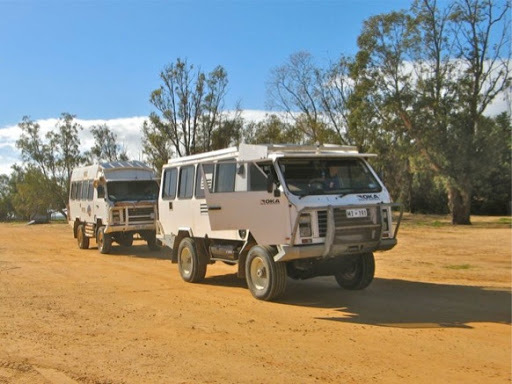 We then called in to the Overlander Roadhouse to refuel and top up our water tanks which had run almost dry. Well, we filled a tank with diesel OK but they had NO WATER for thirsty and dusty travellers, or even us, which was a bit of a bugga. All the taps around the place were dry to the touch and what water they do have is salty bore water. 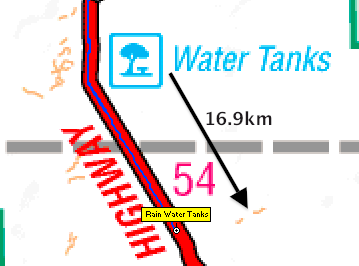 Three Linfox tanker drivers were there having enormous hamburgers for elevenses and they said there’s no good water at Billabong Roadhouse either, but there are a couple of rainwater tanks a few rest areas further south. It took us a bit of time to find them since they were wrongly located on the Hema maps by about 17km. We trudged up and down the highway a few times but couldn’t locate them so gave them away. Then at the very next rest area we reached, there they were, 2 concrete rain water tanks filled with cool clear water. Mind you the turn-and-hold taps were a pain, but we loaded about 60l of water which will be enough for the next few days. 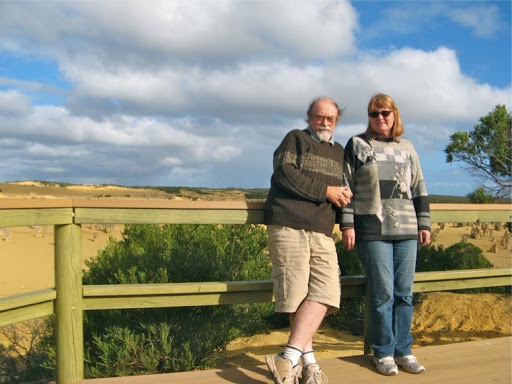 After the water loading effort, Janet washed out a few tops so we decided to stay here the night, and move on to Kalbarri tomorrow. Not strictly photo-free, these are the 2 tastefully graffitied water tanks, and the contents were also tasteful, in an area of little natural surface water and salty bore water. The caravan owner was having a shower and then let the dirty water run all over the ground which unfortunately is a common, but disgusting habit. We heroically collect our shower water in our “snake” tank on the side of the Oka and dispose of it sensitively, when no one is watching (on waste ground of course). We also use it to wash muddy windows and occasionally pre-wash clothes (before it gets too smelly). Water is too precious to just throw away. Today was a sightseeing day. 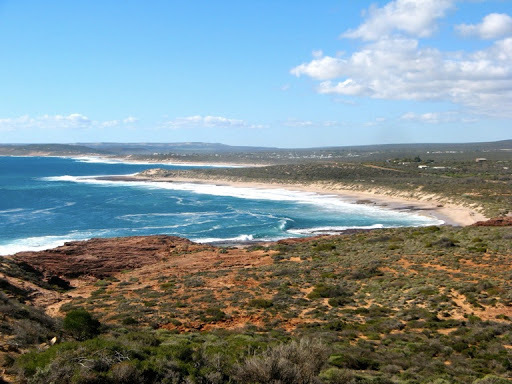 It was only about 60km down the NWCH to the Kalbarri turn off and through the small, almost invisible township of Ajana. 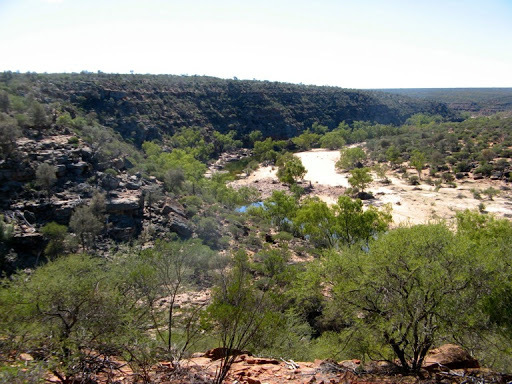 The drive across Kalbarri NP was a bit of a disappointment, kms of low uninteresting scrubland but punctuated by some very pleasant gorges in the Murchison River. 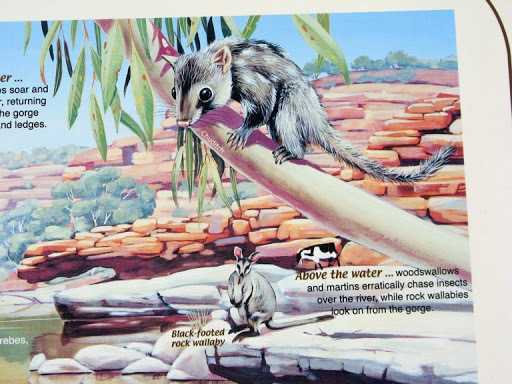 While there we learned that the “Chuditch”, also known as the Western Quoll, had been reintroduced to the park and was making a come-back after being predated by feral foxes and cats. 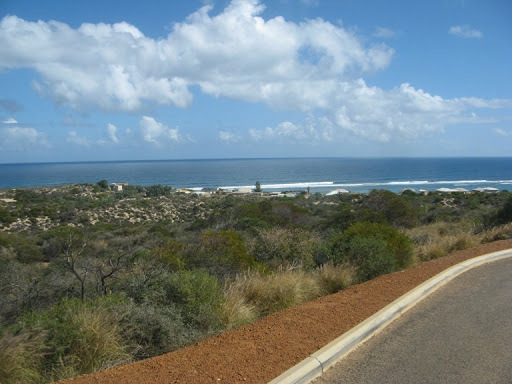 The township of Kalbarri is a pure tourist resort, full of holiday homes and motels but with only a few commercial outlets. 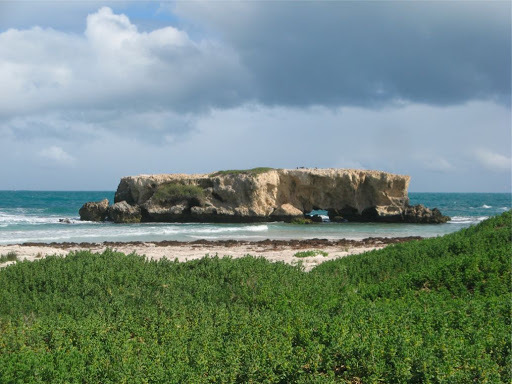 However, it’s beaches and the mouth of the Muchison Rver are quite spectacular as the Indian Ocean waves meet the cliffs and the river with a loud and continuous roar. 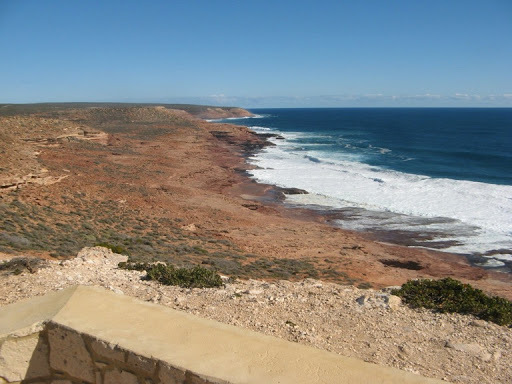 Kalbarri and the Murchison River mouth spread out from a lookout above the town. 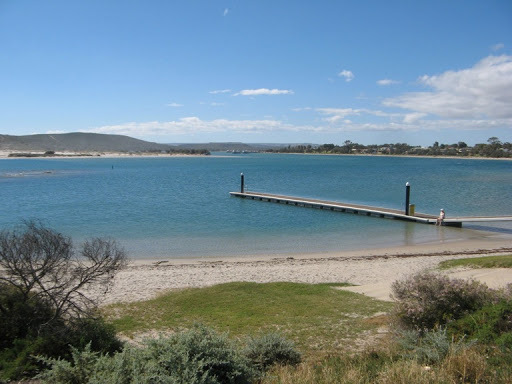 Peaceful Kalbarri nestled on the banks of the Murchison. ...which it hits with a mighty roar. 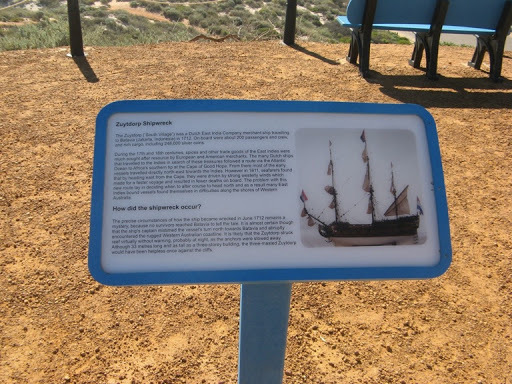 The Zuytdorp (South Village) was a Dutch merchant vessel with 200 people on board when is crashed into the cliffs 75km north of Kalbarri in 1712 while attempting to reach the Dutch East Indies. 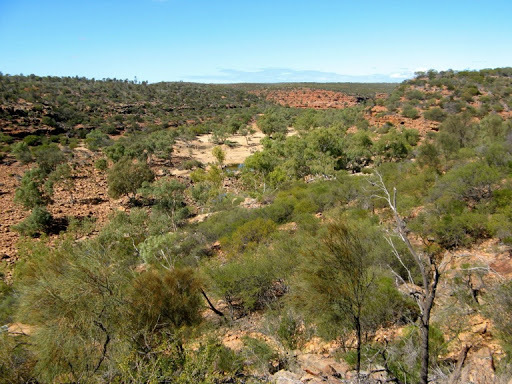 Coins and artefacts found inland proved that here were many survivors, probably assisted by local aboriginal tribes, but none were ever rescued. The remains of the ship laid undiscovered until 1927, 215 years after the wreck. 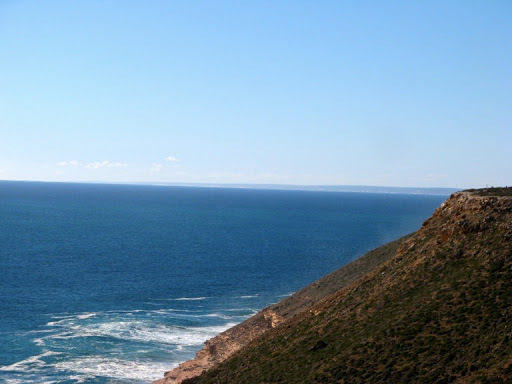 The long line of cliffs which stretch unbroken for 200km into the distance as far as Steep Point, where we were a few days ago, are named the Zuytdorp Cliffs after the wrecked ship. 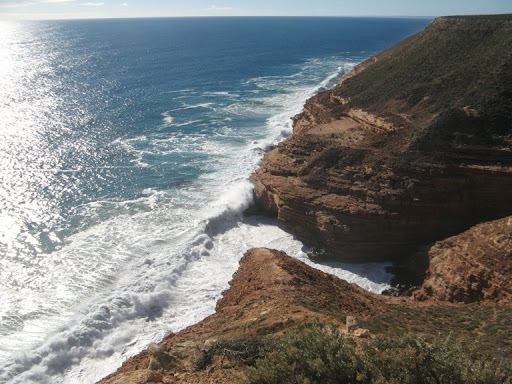 We played tourists for the afternoon, seeking out all the other spectacular seascapes south of Kalbarri. 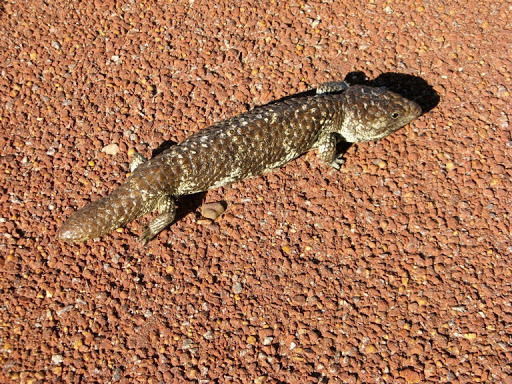 And met a sleepy lizard on one of the walkways. 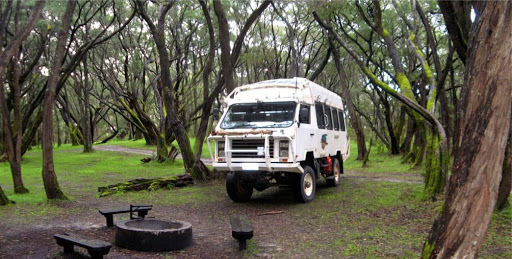 After the sightseeing we headed down towards the Hutt River Province (an independent state which legally seceded from Australia in 1970) and camped in a clearing on the side of the road. Today we left Australia, but only for an hour and we didn’t have to go overseas. We did have to get a visa to enter and leave a foreign land but that was only a token $2. 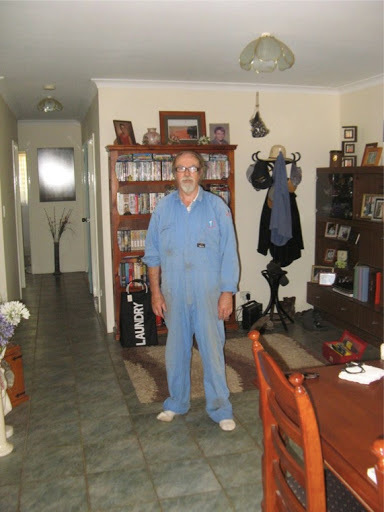 In 1960’s, Leonard Casley was a wheat farmer in the mid-west of WA when the WA government attempted to bring in a law which restricted the right of farmers to grow (and therefore sell) more than a certain acreage of wheat in any year. 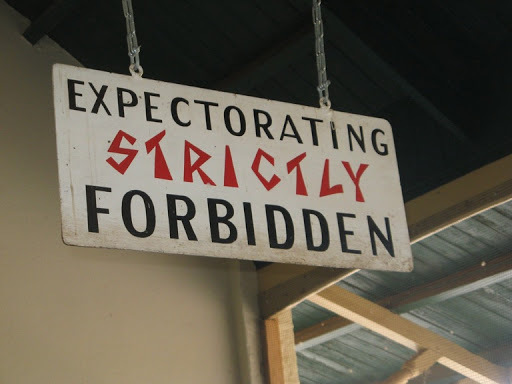 Leonard objected strongly to this law and declined to comply. 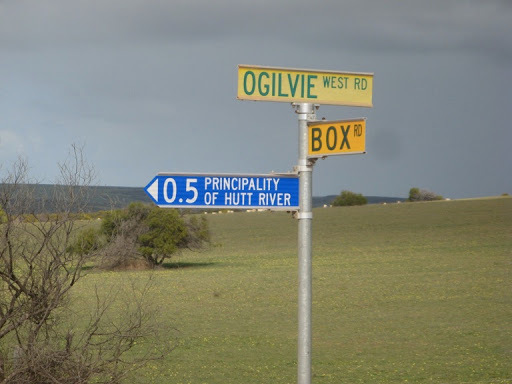 His objections were ignored so after a lengthy legal and constitutional battle, he declared his Hutt River property to be a sovereign state and seceded from Australia. With his background knowledge in constitutional law he proved a significant problem to the Commonwealth of Australia, but eventually it had to accede to his petition and the secession was found by the courts of Australia to be valid. It took many years for all the various points of order to be successfully argued, but he succeeded. 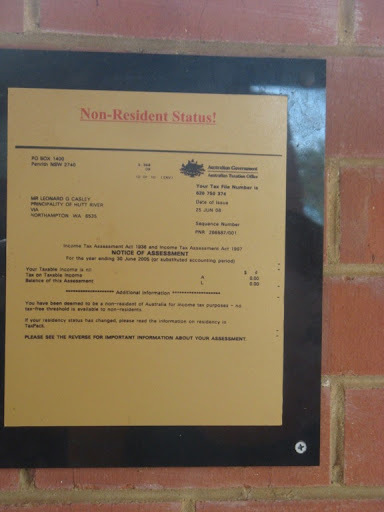 Even the ATO finally concluded that Hutt River Province was indeed not a part of Australia and that HRH Prince Leonard as he was now known, was not a citizen of Australia and therefore not subject to Australian taxation. It would be easy to classify Prince Leonard as a crackpot, but he is no ordinary crackpot. He has his head screwed on and is a very intelligent man. He is a scientist and has written many scientific papers for NASA and even has a star named after him. 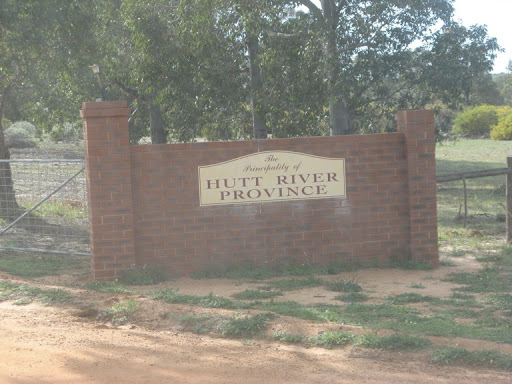 For 43 years, Hutt River Province has been a separate sovereign state and a succession of Australian governmental lawyers have failed to reverse this position. 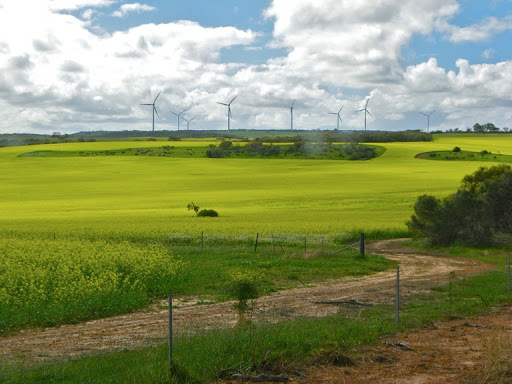 In fact they have been attempting to find a solution to his claim for compensation (which has never been settled), over the original wheat restrictions (which were dumped after 10 years), even to the point of offering him large areas of land which included a section of the Australian coastline. 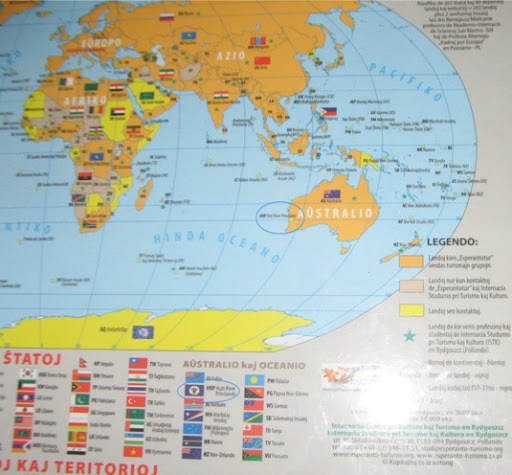 Both sides backed away from that suggestion due to the prospect of the land, not being Australian territory, being used as an entry point for illegal immigrants. As a non Australian, Prince Leonard is illegible to vote. The Province has it’s own government, flag, mint, stamps and offices. His cars, including a Rolls Royce, have number plates issued by the province (HRP 001 etc). The country, which is as big as Hong Kong (18,500 acres, 75 sq km) and 58 times as big as Monaco, is recognised by many other countries around the world as a sovereign state. 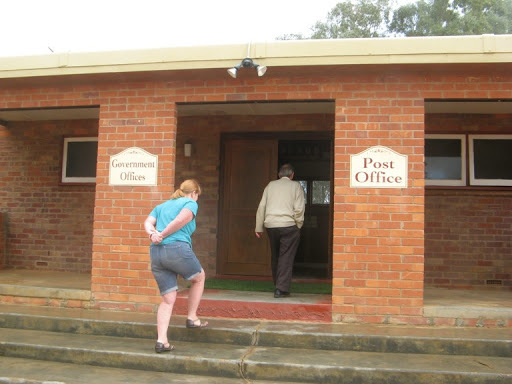 Janet servilely following HRH Prince Leonard into the Government Offices. 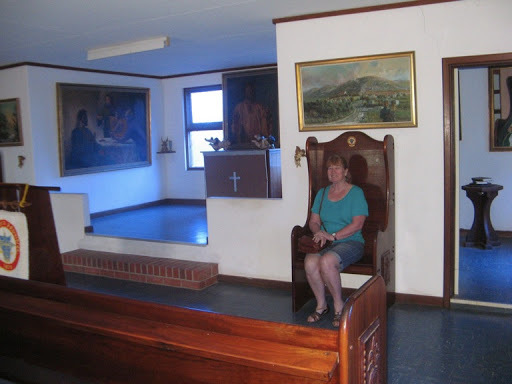 Janet sitting in the Princesses chair in the Royal Chapel. We met Prince Leonard and spent an hour with him as he showed us around his remarkable “provincial” buildings and museums which are full of significant treasures and artefacts. It would be hard to dispute that he has a case and has obvious commercial and legal drive. The province has 30,000 visitors a year and if they all spend a few dollars, that’s a good steady income. Grudgingly he does accept “foreign” currency, which of course is tax free. His latest project is to demonstrate that legally, the State of WA does not exist, as the correct royal signatories were never put in place, and that all Australian elections since federation are actually null and void. It would be easy to become convinced that he might just succeed, but to what end? Sadly HRH Princess Shirley, Leonard’s wife of 66 years, passed away only a month ago and will be remembered with the printing of a special principality stamp. Prince Leonard is now 87 and an interesting legal situation will be created when his time comes too. It was an interesting visit and not your average overseas trip. More information can be found on the official Principality website (note the significant absence of the .au in the web address). 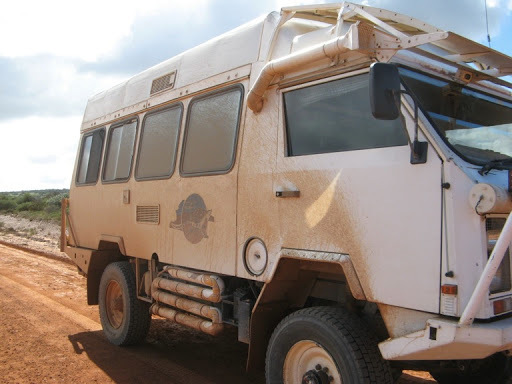 After our international tourist adventure we carried on down the damp and sandy Hutt River road system and got the side of the Oka covered in foreign mud. 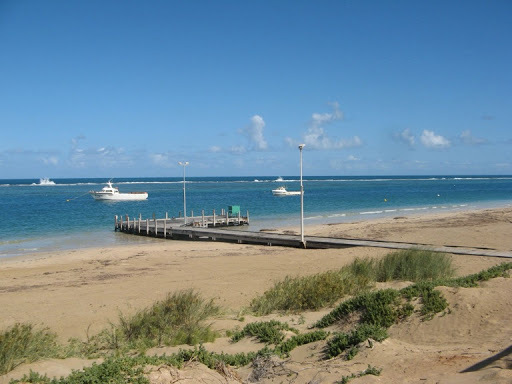 Port Gregory was our next location, a small fishing village on the coast (obviously). It was noticeable only for the reef of rocks just out to sea on to which the Indian Ocean vents its wrath. Just down the coast is the much nicer small town of Horrocks but with the same reef of rocks out to sea. 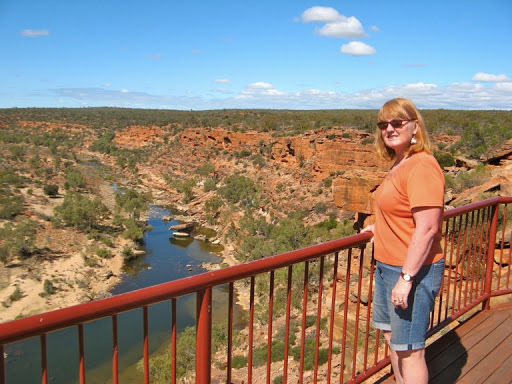 Janet vainly attempted to wash off the foreign mud with good Aussie water. 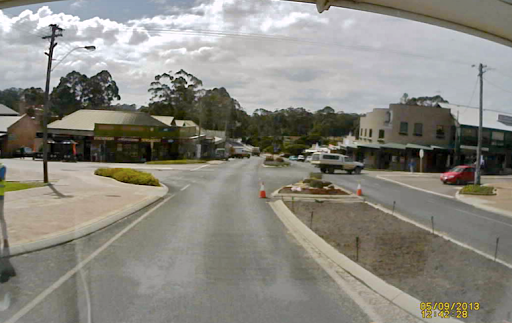 Northampton, a few km inland, is a pretty little town but was completely shut for the weekend. Nothing was open, not even the visitor centre, so about Northampton, we know nothing. 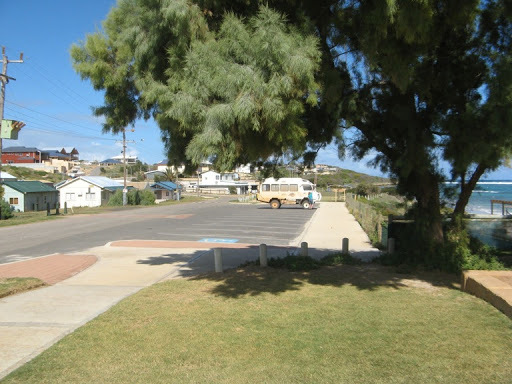 So we motored on down to Geraldton, a very large town, and found a reasonably priced caravan park for a couple of days. 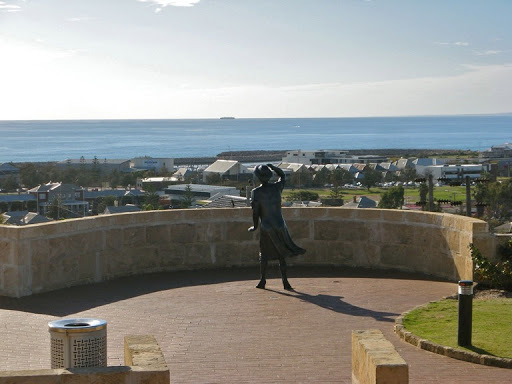 A sunny day out in Geraldton. This morning we did shopping, at the first real supermarket we’ve seen in a month. 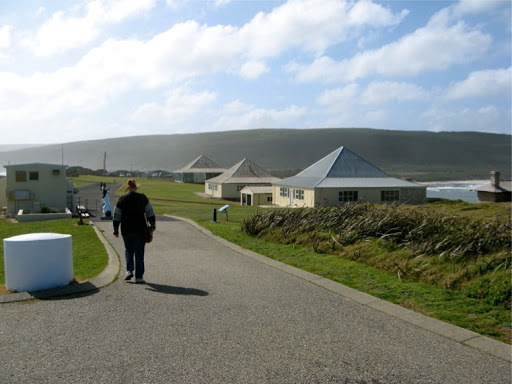 The visitor centre was just around the corner so we got a map and directions to a gas bottle refiller and the museum. At the BCF store, I plonked the gas bottle on the counter where there was a very pretty blond girl serving, and a great clod of red mud fell off on to her nice clean counter. I hurriedly cleaned it all off into waste basket and honour was restored. Then she under-charged me by $10 for the gas so I felt a draw was a good result. The museum on the water front was quite good, especially the displays on a number of Dutch ships which had been wrecked on the coastline. 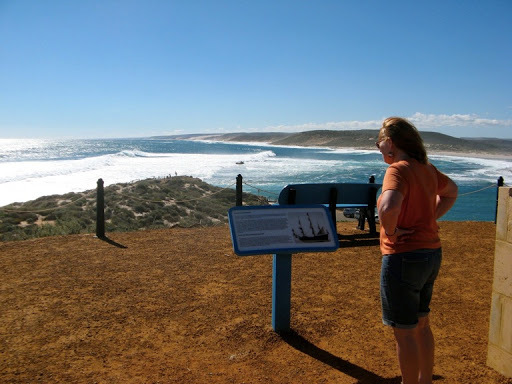 Actually only 4 Dutch ships were known to have been lost on the WA coastline out of the 170 odd that they lost worldwide, but they made quite an impression (literally) on the evolution of European settlement/invasion/occupation of the Australian mainland. The most famous was the Batavia but the Zuytdorp (South Village) and Zeewyjk (Sea Witch) were also treasure laden ships heading for Batavia (now Jakarta) in the Dutch East Indies, which missed their left turn and hit the reefs of Western Australia instead. 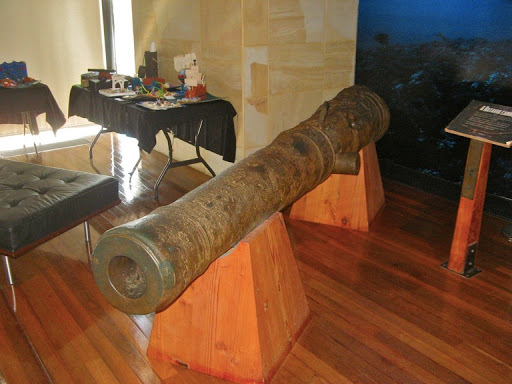 A bronze canon recovered from the Batavia after 200 years on the sea bed. 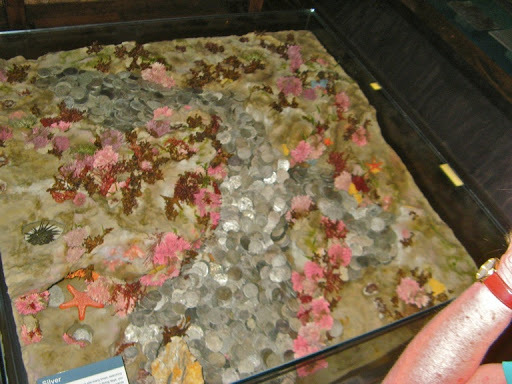 A treasure trove of silver coins that the survivors of the Batavia were unable to recover. 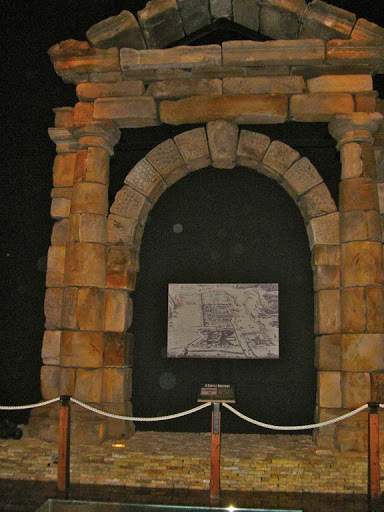 Amazingly, all the huge stone blocks (24 tonnes of them) in this portico were carried as ballast in the hull of the ship and intended as a castle entrance in Batavia. 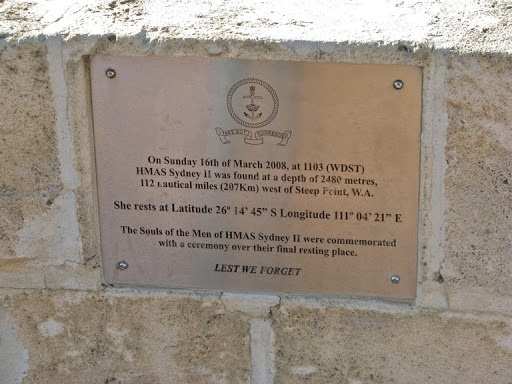 After the museum, we went up to the moving memorial, set high on a hill overlooking the port, to HMAS Sydney, which was sunk in a brutal encounter with a German armed raider, the Kormoran, in 1941, with the loss of all 645 crew. The Kormoran was also mortally damaged and scuttled, but most of its crew survived and were interned as POW’s until 1947. The wreck of the Sydney was not discovered until 2008, 67 years later, lying in 2480 m of water, 207 km off the coast. 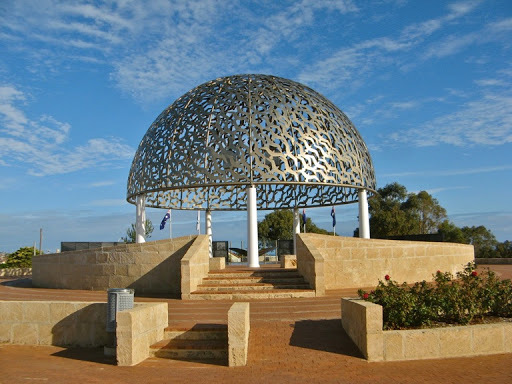 The memorial comprises a seven columned dome covered with 645 stainless steel seagulls, one for each sailor lost. But the symbolism doesn’t end there. 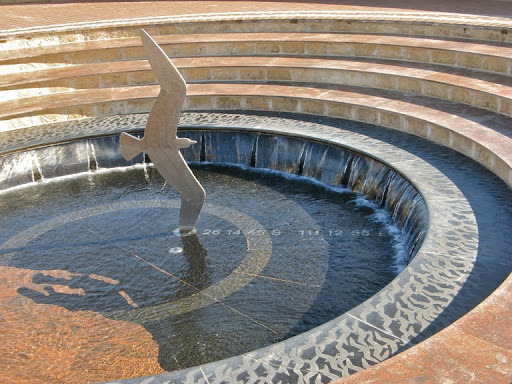 A circular pool of water symbolising a watery grave has the outline of WA coast and the exact location and coordinates of the wreck engraved in its base. A very lifelike statue of a woman leans into the win as she searches seaward, hoping forlornly for the return of the ship and its crew. 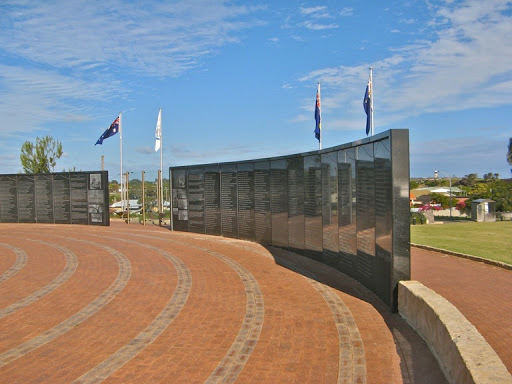 The circular symbolism is completed with a curved wall of black granite carrying the names of all 645 crew members. A slow drive day today. 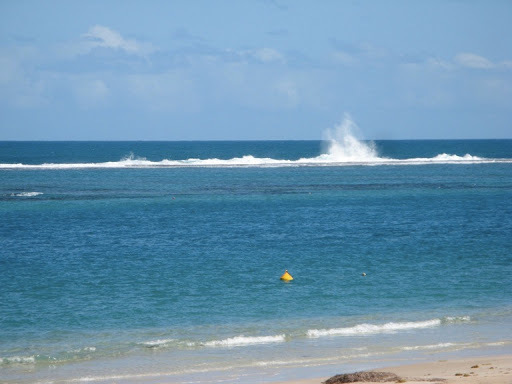 We toddled down the coast calling in at Separation Point, Tarcoola Beach and Cape Burney, all typical urban beachscapes. 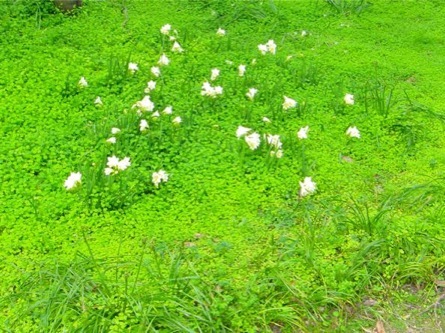 The countryside is green and lush like rural SA, with familiar weeds but quite pleasant. However we yearn for the outback. 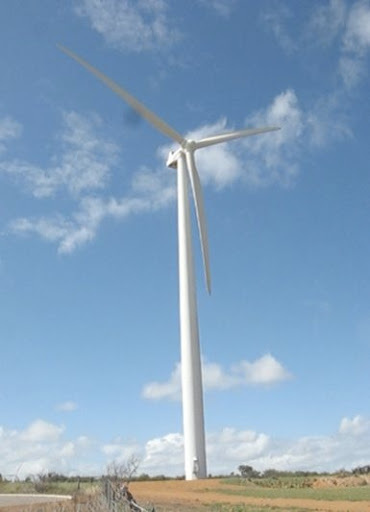 And on to its more modern development, a huge wind farm of 60 odd turbines scattered across the countryside. 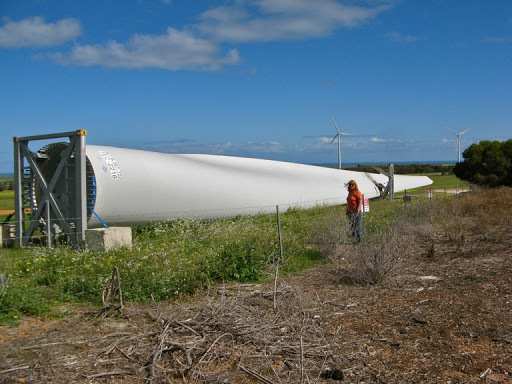 But when you see a spare blade lying on the ground, at 40 m long and weighing 7.5 tonnes, they start to look enormous. We are camped tonight at Ellendale Pool, a 1km long fresh water billabong on the Greenough River, popular with tourists in pre-European times. 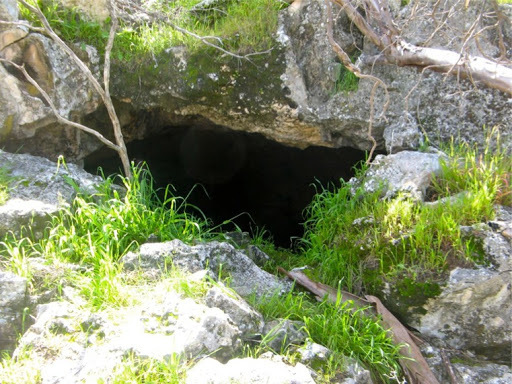 Tomorrow a slightly longer hop via the Coalseam Reserve, the first coal mine in WA, and though Mingenew (pronounced Min-gen-oeuirl or thereabouts) to Tony’s farm on the Arrowsmith River. 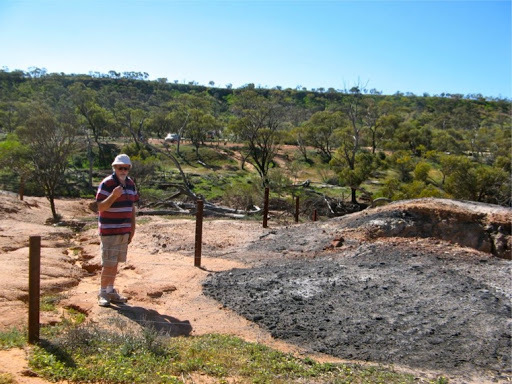 Coalseam Reserve was quite a revelation. 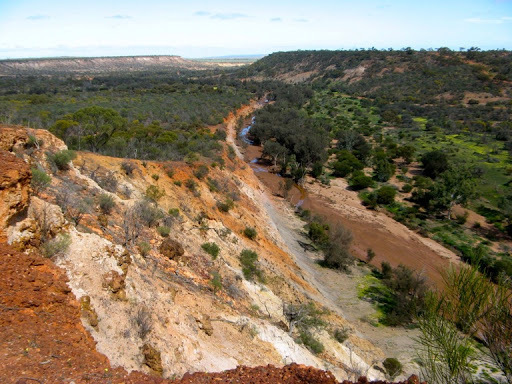 Apart from being the site of the first but ultimately unsuccessful coal mine in WA, it is also on a very picturesque section of the Irwin River valley with coal seams still visible on the walls of the cliff. 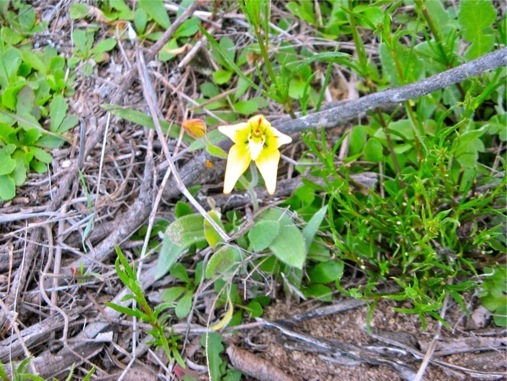 The view from the cliff top lookouts is also picturesque, as are the wild flowers along the walking trails. 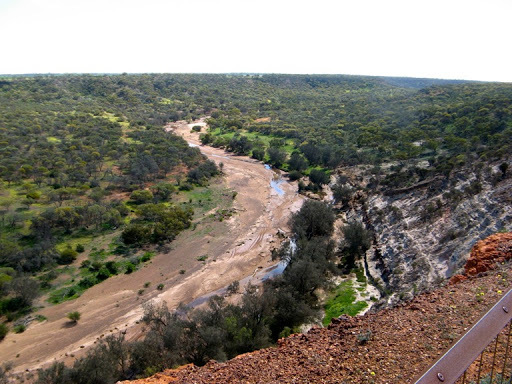 To get to the coal mining shafts, J had to take a leap of faith across the muddy Irwin River. Where unsurprisingly we found lumps of coal. 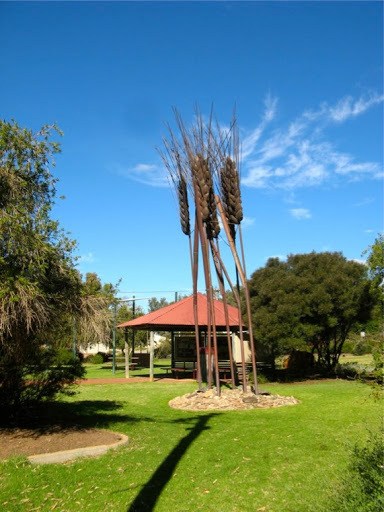 Coalseam Reserve is also a very attractive camping area and would have made a better campsite than the damp and muddy Ellendale Pool area. From Coasleam it’s only a 30min hop down to the aforementioned Menginew, a pretty and fairly affluent small rural town. It has a glacial boulder as it’s emblem and some sturdy looking steel wheat sheaves in the local park. 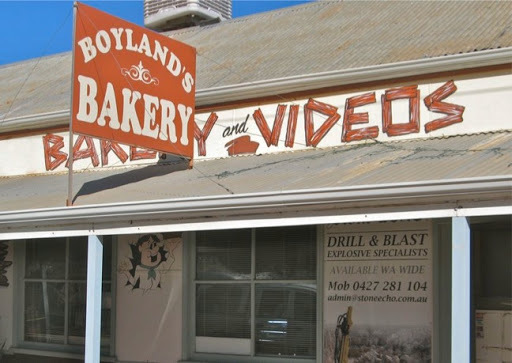 It also has a bakery, but you might want to check out the ingredient before consumption. Another 30min hop took us down to Tony and Fleur’s farm where our Oka’s met up. 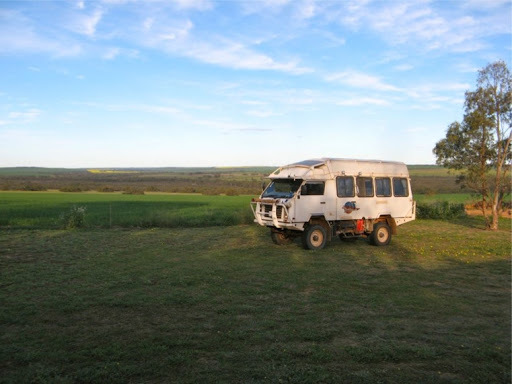 Tony and Fleur’s farm is 18500 acres of crops and sheep, but what give it its real interest is the huge are a of natural native bushland in the centre. 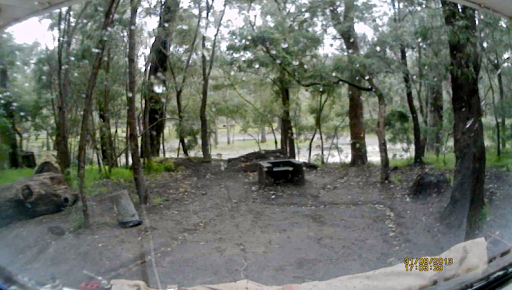 Our campsite with bushland in the middle distance. 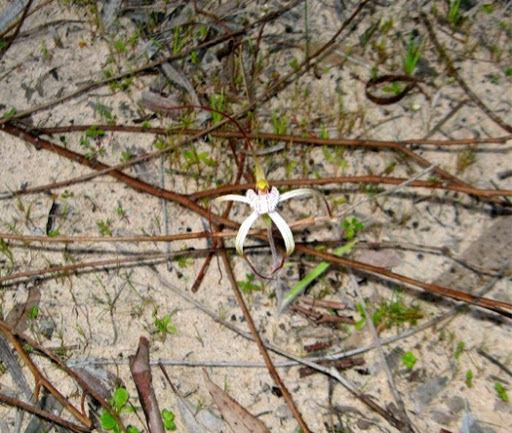 Apart from the scenic bushland, there are a couple of dozen orchid types to be found there, some of which are quite rare, plus mound springs, creeks and small water falls. 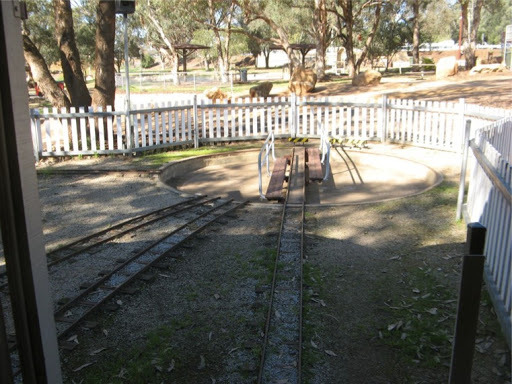 It would be a bush walkers delight. 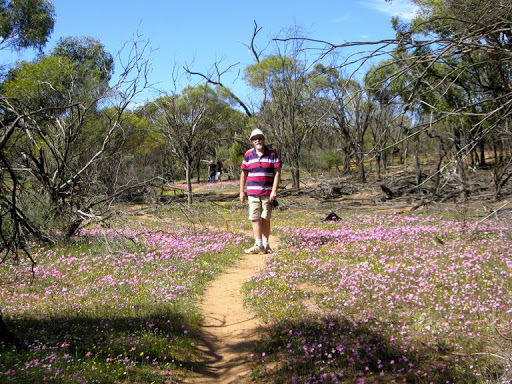 Tony took us on an hours drive around the native bushland which is the largest privately owned tract of native bush remaining in the area. 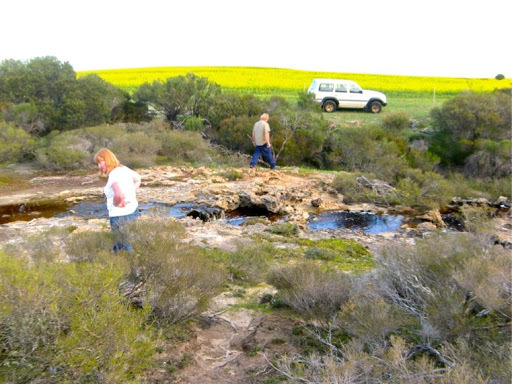 Mound springs just pop up anywhere, including in the middle of the track. We had a very nice BBQ dinner with Tony and Fleur and their 3 children, 2 cows and what appeared to be 27 very friendly dogs. We also polished off at least one bottle of red wine, maybe more. The red wine had worn off and we took the Oka to Tony’s truck wash bay as he was concerned that the white slushy mud from the Useless Loop road was actually waste salt workings and would quickly corrode any metal it remained in contact with. A high pressure hose soon had the Oka looking like its previous grimy self, just ready for the red slushy mud that would surely come later in the day, and it did. 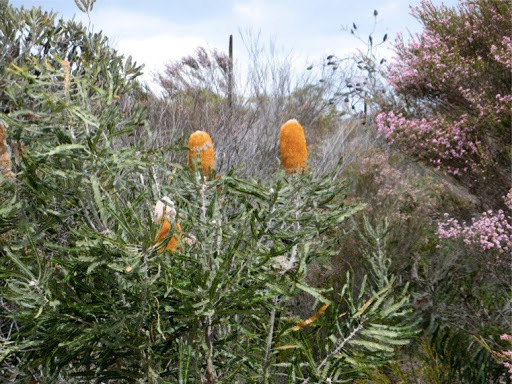 After a tour of inspections of our Oka’s, we set out in convoy to see some of the more outlying local scenery, including the Yardanago Nature Reserve with it’s beautiful pinky-orange (coral J says) banksia nuts. 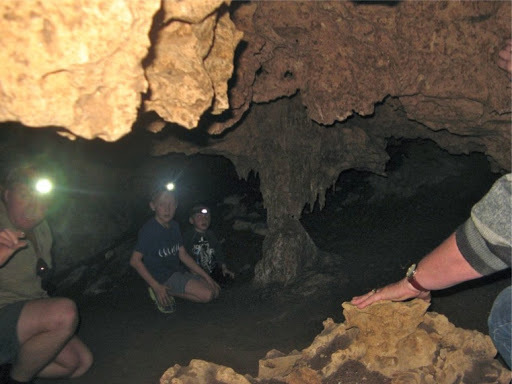 We stopped for a look along a river cave which involves scrambling over limestone rubble and minding our heads, feet, elbows and shins on the sharp rocks in the pitch blackness. 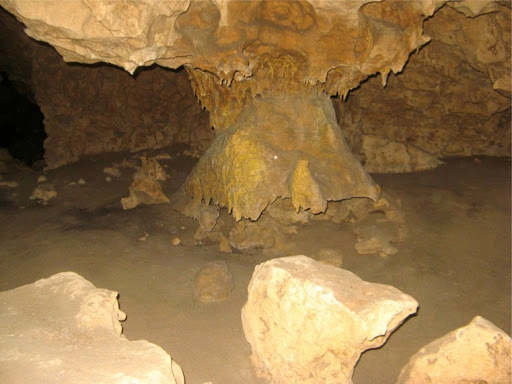 The reward was some fine examples of ancient cave furniture. 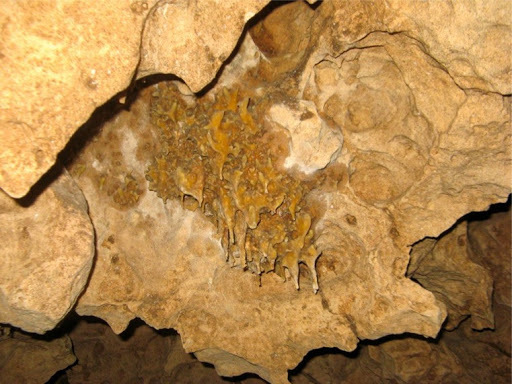 Fortunately today the cave was dry but the evidence of previous flooding was all around us, rotten timber, a few bones and of course the stalactites which would not grow without water. 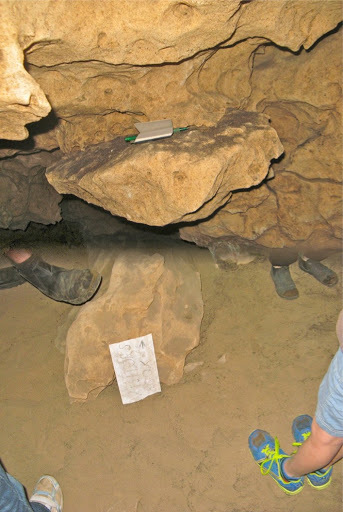 We were surprised to find a visitors book about 100m into the cave in which we scribbled our innermost thoughts, like “are we there yet” and “where’s the exit?”. Thereafter the weather started deteriorating, a strong gusty NW wind followed shortly by cold rain showers. 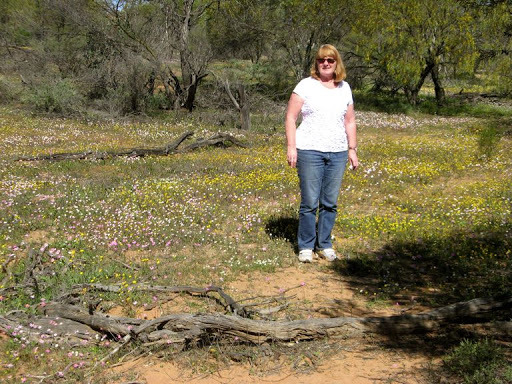 We did manage to locate a few more Orchids in the Lake Logue Nature Reserve, but they were still not quite at the flowering stage for a full on carpet effect. As we had come quite a way south of the farm and it had become very cold, wet and windy, we decided to continue our travels southwards and said our hurried goodbye’s in the wind and rain on the side of the road. We very much appreciated Tony and Fleur’s hospitality and expect to meed up with them again at the Harrismith gathering in a few weeks time. 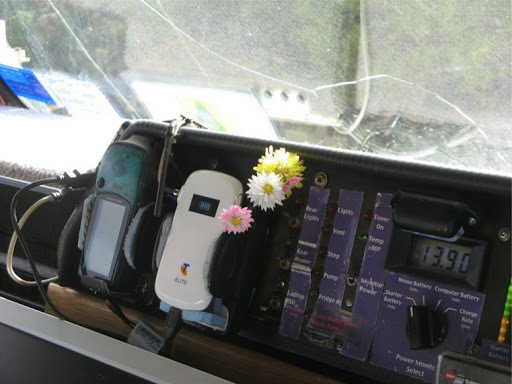 Everlasting flowers adorn the dashboard. 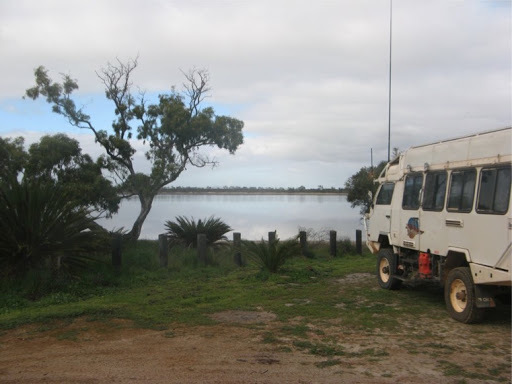 We are camped at Lake Indoon, a round freshwater lake close to the coast , normally this would be a very welcome sight, if it weren’t for the cold, wet, grey and gloomy afternoon (did I already mention that?). Luckily I can get phone reception with an external antenna so all is not lost. 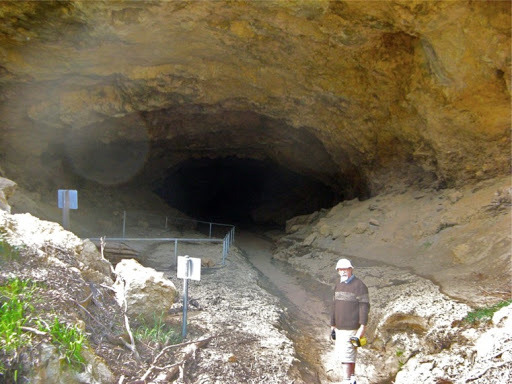 Tomorrow we’ll take a look at the caves in Stockyard Gully, if the sandy access track is navigable. 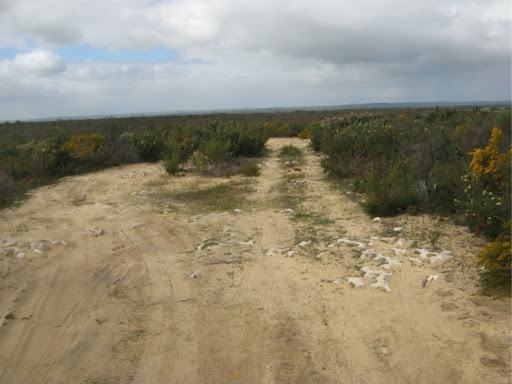 Actually yes, the Stockyard Gully track from the north is navigable but it is still narrow and full of large white boulders so it’s slow going to avoid tyre squeezing or diff damage. One of the rocky sections. 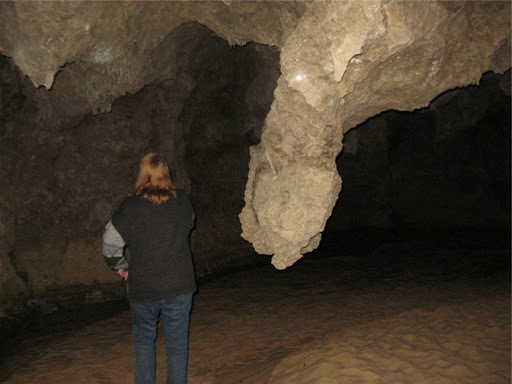 The cave is an interesting walk, like Tunnel Creek but without the water (unless the creek is flowing). Pitch black for 200m but with a large rock hanging down about half way through to catch unsuspecting heads. 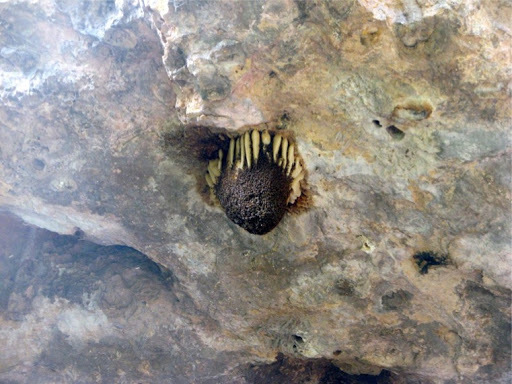 There ere huge nests of bees at each entrance with warning signs about their aggressiveness. 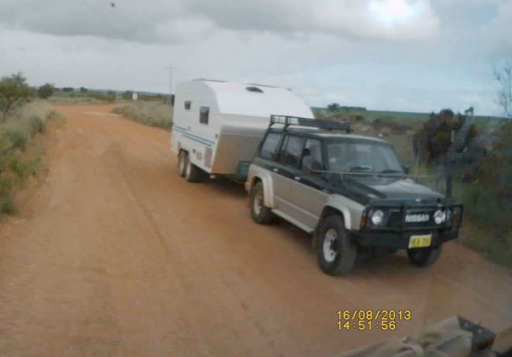 The track out south towards Jurien Bay was shorter and a bit easier but at the start of the track I still had to stop this fellow and recommend strongly that he didn’t take his caravan in any further. 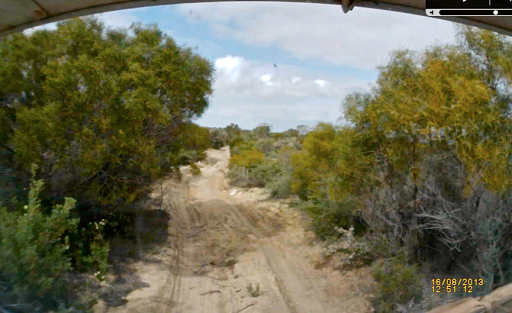 The track was narrow, rough, sandy and there were no turning around places. Caravans were prohibited anyway but there was no sign at this end of the track. I suggested unhitching his caravan and leaving it behind but he declined to do that and decided not to go. 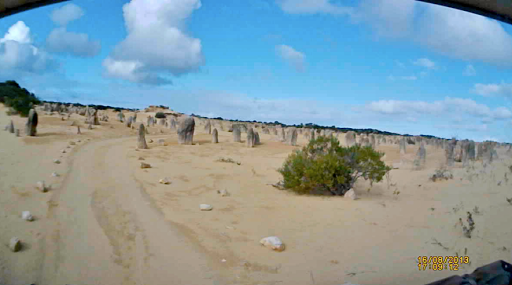 It rained later in the day and we did consider missing out the Pinnacles in the Nambung NP. 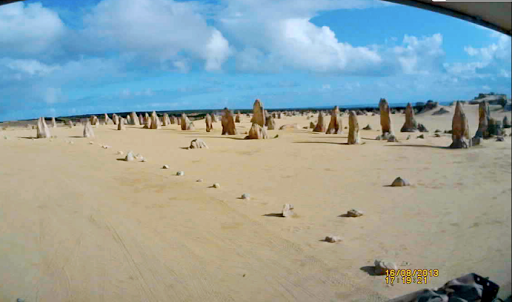 But then the sun came out for an hour and we had an amazing drive and walk around the strange rock formations. The display covers a huge area and the drive though them is more than 4km. 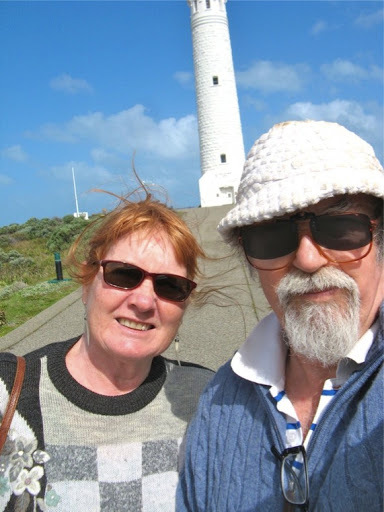 After our hour long tour in bright warm sunshine, the weather closed in again as we were leaving and we headed down to Lancelin to a CP since none of the NPs in this area have any camping facilities. 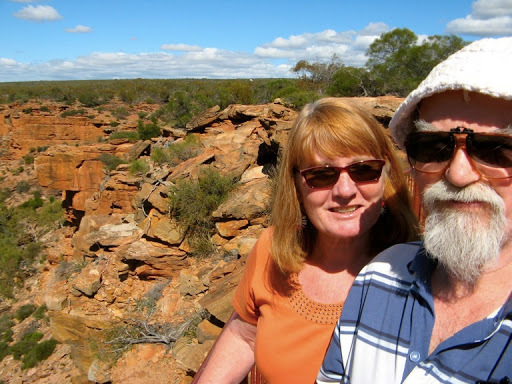 Tomorrow we are heading down to Bullsbrook, north of Perth to visit our friends Dave and Pauline who traveled the outback with last year..
For the next 10 days we stayed with Dave and Pauline enjoying some R&R and first class home cooking, while helping around the house and with Dave’s Oka upgrade. 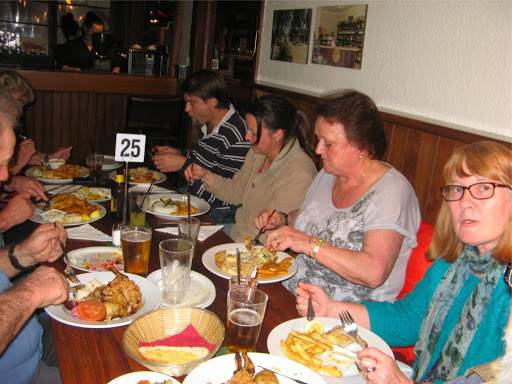 Dinner out at the local pub. 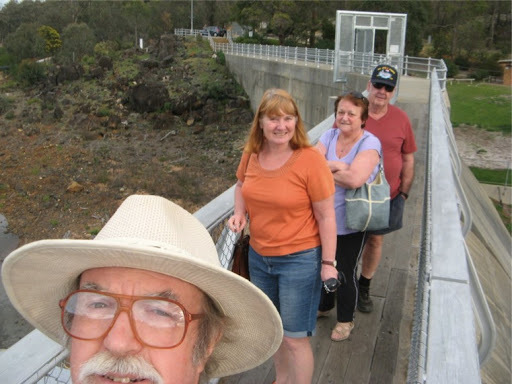 Moondyne Weir on the Avon River. 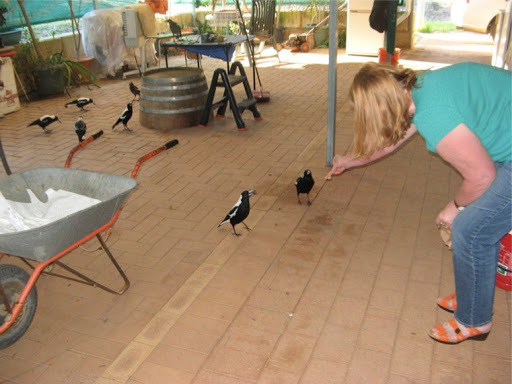 Feeding the pet maggies, which then cr*pped all over the patio. Dressed to kill, in Pauline’s ovies. Luckily they weren’t pink. 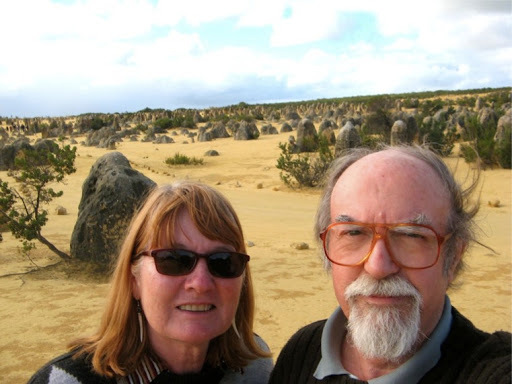 We borrowed D&P’s car and called in to see Bernard (Diane’s cousin) about 30km south, for a merry afternoon of reminiscing, tea and cup cakes. Sadly we left Dave and Pauline this morning after forgetting to bring the jam and garden produce they offered us (but not the drill or tool kits I had left out) and set sail southwards. 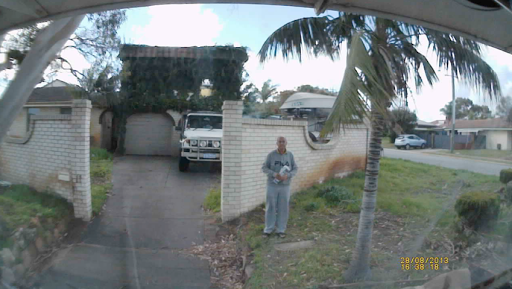 After refilling the larder at Ellenbrook shopping centre, which is so new the car park roads are still sandy tracks, we called in again on Bernard to show him the Oka which he hadn’t seen in all its completeness since it was parked in his driveway in 2003, just after we bought it. After an approving tour of inspection he directed us down Marmion Avenue which is a very attractive coastal road to Fremantle. 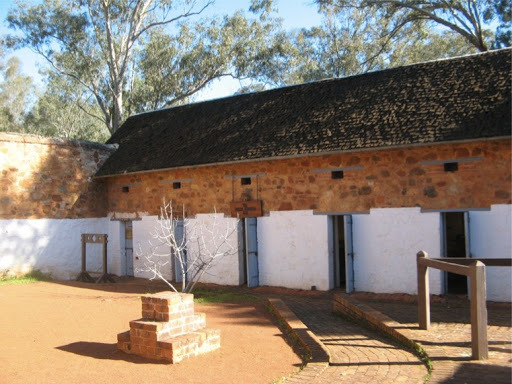 We did a city tour of Freo, more by accident than design, and they have certainly preserved a lot of old buildings, including the old prison that we toured around in 2003. We passed by the very dock where we and our old Land Rover arrived from Singapore in 1975 and reminisced a bit about our tentative early days in Oz. It’s been a long and fruitful journey since then through careers, families, wealth creation and the opposite, but overall it’s been a very good period of our lives and despite the difficult times, we have no regrets about making Oz our home, except of course, the enduring pain and guilt about leaving good friends and rellies behind. 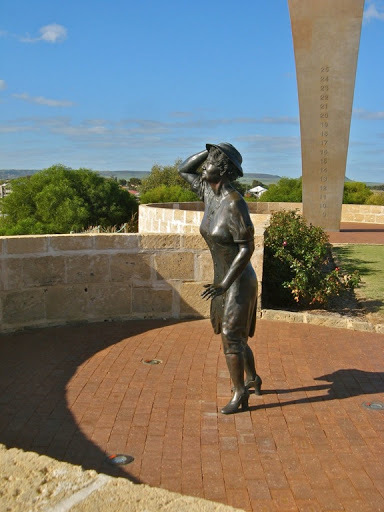 As the docks and old suburbs of Freo gradually petered out to be replaced by endless new beachside housing developments, we passed by Kwinana and Rockingham and unexpectedly found ourselves on the outskirts of Mandurah, a huge and growing satellite city 70km south. Here the traffic is worse than Perth. 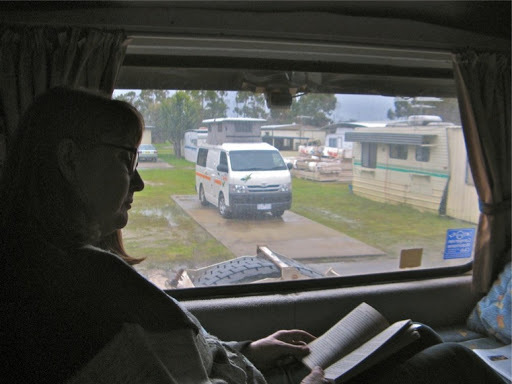 None of the beachside suburbs had caravan parks and the freeway was no place to look for a camp site, so we checked in at the only caravan park we found, which wasn’t too bad except they no longer offer unpowered sites, only powered sites whether you use power or not. A disturbing trend for the growing number of totally self-sufficient motorhomers who only need a patch of ground for their 4 wheels. $35 for a few trips to the loo and a couple of showers seems a bit steep. I suppose I could have jumped on the bouncing castle to increase the value of our stay. Still, funny how things balance out. This morning I refilled a gas bottle at Ray’s Outdoors for only $13.50, the cheapest ever in our recall. 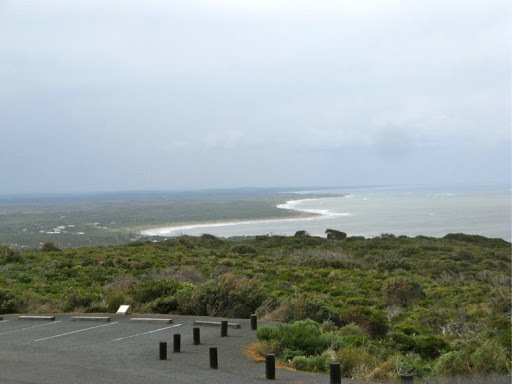 We headed further down the coast and resolved to lunch at Myalup Beach, only because it was about the only track seaward off the highway. 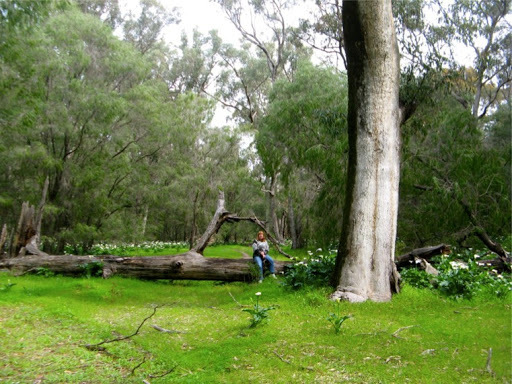 A pretty little settlement of one small shop, a caravan park and the Indian Ocean Bush Retreat. It seemed totally devoid of people, but someone had obviously been there. We could tell because of the extensive welcoming signage in the small beach car park. I made a collage of the signs. After a quite lunch we pushed further on, but not far. Since there was a break in the traffic I shot across to the RH lane and dived down a track to Leschenault Conservation park. It had a camping sign with no red line through it. 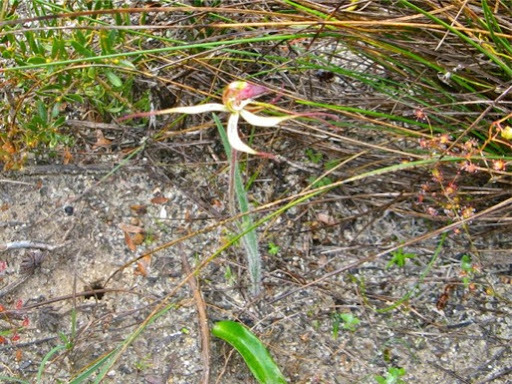 The Leschenault Peninsular was named after the botanist on Baudin’s exploration ship The Geographe, after which the nearby bay is named. 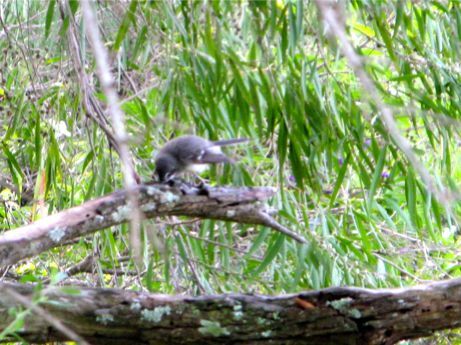 We found a nice secluded campsite and wandered along the shore line where we were certain tiger snakes would be seen and instead saw a grey fan tail (between fans), funeral lilies, freesias and a fallen tree. I did wonder if this one made a sound when it fell in the forest? A cool but not cold night with regular showers, and a cloudy sunrise. Suddenly we realise that we’ve left tee-shirt and shorts behind and are back into jeans and jumpers weather, and solar charging is at a minimum. This is a very soggy water featured area but no leeches or mossies so far. Today we splashed our way through Australind to Bunbury and their new huge roundabout with 4x 6 lane junctions, 8 sets of traffic lights and a lake in the middle. We had rushed there in order to find a pre-election polling place and so exercise our democratic right to vote in the next calamitous government. 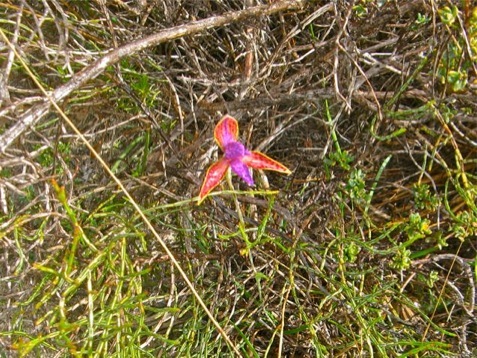 While there, having invested 90ç in a ticketed parking place (even the shopping centre has ticket parking), we recharged our medical supplies at the drug replenishment centre, or farmacy as they’re known, topped up the veggies and received a spectacularly small amount of info from the ℹ-centre on the Cape Naturaliste National Park. 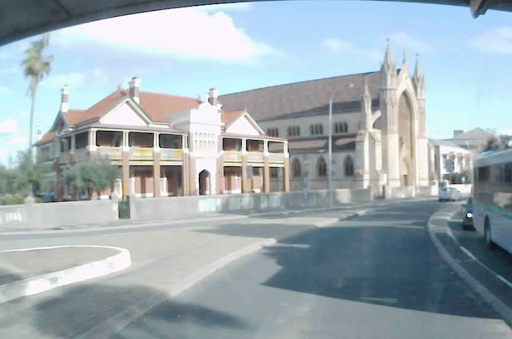 Despite all that, Bunbury is a very attractive town with all new looking buildings, a nice foreshore and a good light industrial area with all the stores you could reasonably want, and several you didn’t, in one compact area. For example, we called in at Instant Windscreens, on a whim and because there was no traffic coming, and asked about their replacement policy. 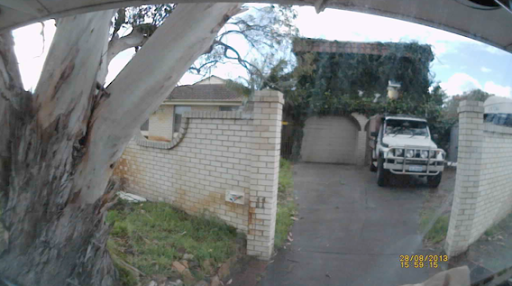 “Trevor” came out and inspected our windscreen damage and confirmed that there was no stone strikes and the cracks (now numbering 2 and 1/2), were due to stresses in the glass. He then called IW in Salisbury, who fitted the replacement, and arranged for them to replace it again when we returned to Adelaide. Good service. In addition he scribbled a note on a card so that if the police stopped me, I can justifiably claim that a replacement has been organised. Apparently the Bunbury police had recently had a purge on cracked windscreens, good to see our taxes being effectively utilised. 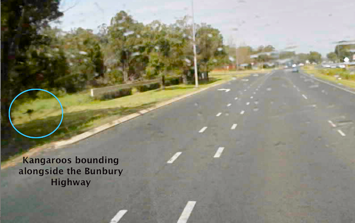 Reenergised, we set out for Busselton as 3 kangaros bounded alongside the Bunbury Highway. 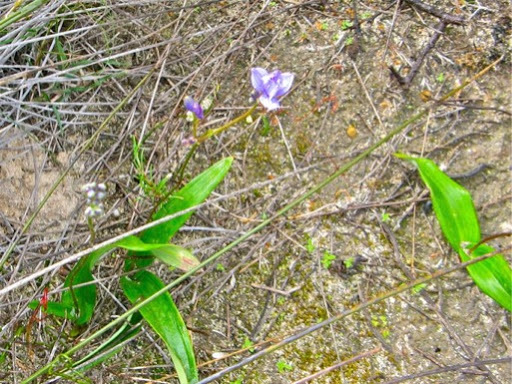 A very pretty pest (the lilies obviously). 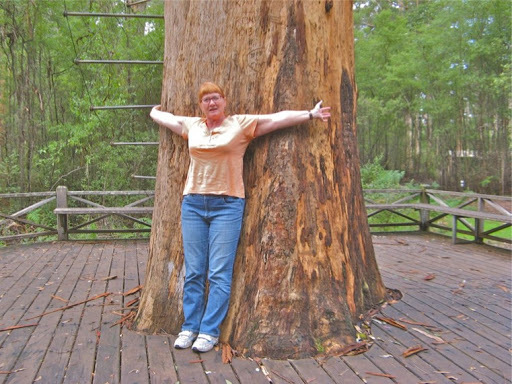 J said she felt like a garden gnome amongst the huge Tuart Gums (Eucalyptus gomphocephala. I have some junior versions in our garden). Along the Forrest Beach road, the blustery wind had got up and rocked the Oka from side to side (it wouldn’t be up and down would it?) 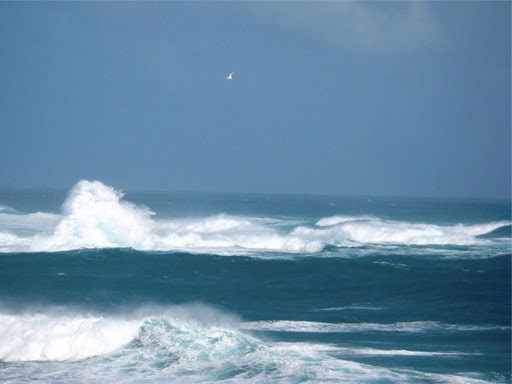 and the surf was a raging English Channel grey. 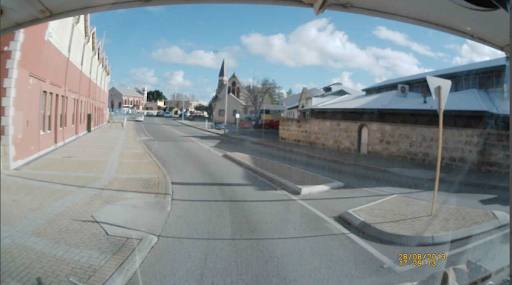 Busselton is much smaller than Bunbury and much easier to pass straight through. 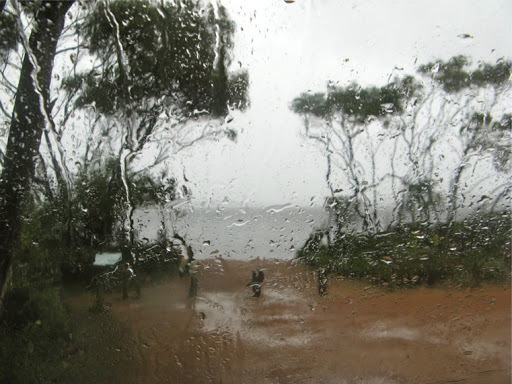 We did plan to visit the 2km long Busselton jetty but I found myself in the minority, due to the wind and rain, so we carried on to Dunsborough. This is much smaller again but the ℹ-centre was much more informative: there’s no camping allowed anywhere in the National Park. Bummer. But they did provide us with a brochure showing us all the places we couldn’t camp. By now a gale was raging and the horizontal rain was making driving difficult so regretfully we sought out a caravan park. 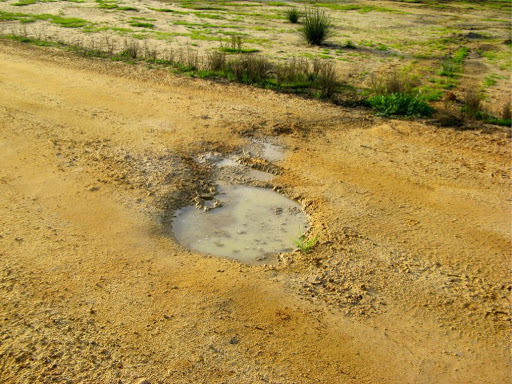 It had concrete pads for vehicles, which was just as well as ducks were encamped in the small lakes around the sites. The delightful view from our caravan park site. It’s now raining so hard I can hardly hear myself type. 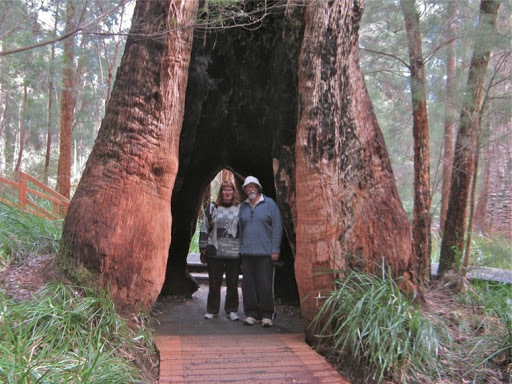 Tomorrow it will all be better and we can visit some of the spectacular sites in the 140km long National Park. Well tomorrow came in like a wet f*rt. It rained for much of the night and was violently windy for most of the day. 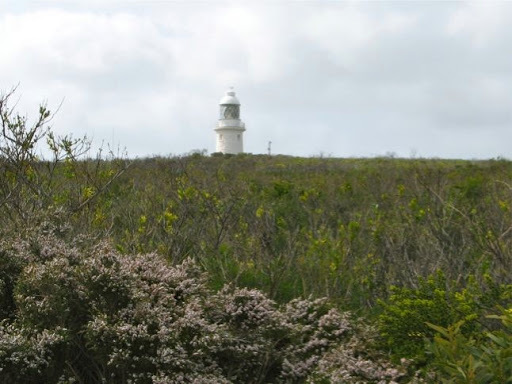 Neveretheless, we did do a trip up to Cape Naturaliste lighthouse via all the small high class beachfront housing developments along the way, which seems to spoil the National Park atmosphere a bit. 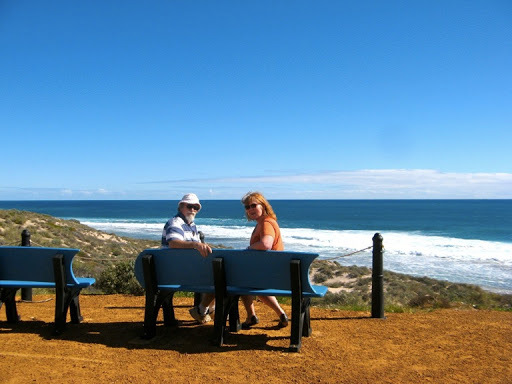 We did a cliff top walk around the tip of the Cape where the indian Ocean bends around and heads into Geographe Bay. Retracing our steps we sought out the BWS shop in Dunsborough to restock with plonk for this week and the Oka gathering at Harrismith next weekend. 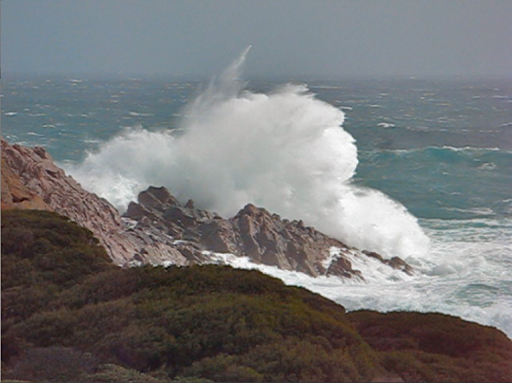 The highlight of today was the trip out to Sugarloaf Rock where the gales had whipped up the Indian Ocean into a white topped frenzy. 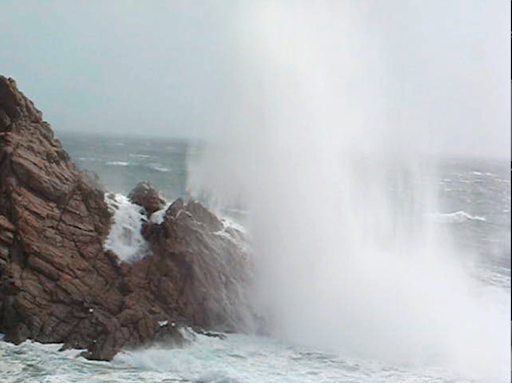 One of the waves soaked us, even from 100m away. 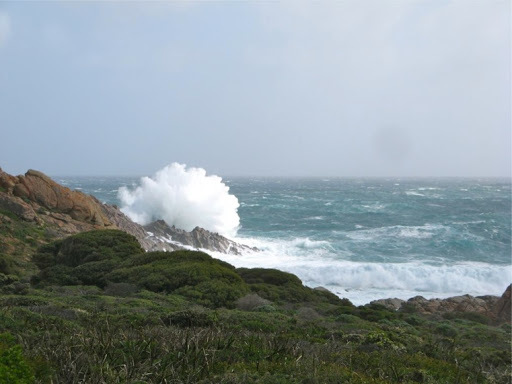 This was only a partial gale so heaven help those whose ships were wrecked on the Australian coastline, like the Zuytdorp, which hit the cliffs near Shark Bay in June 1712. This was the only Dutch ship to hit the WA coastline that no one was ever rescued from, although evidence is that a few of the 200 people on board did reach the cliff top but were never heard from again. 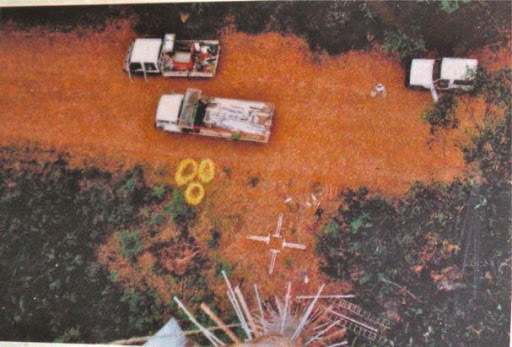 It was another 240 years before the wreck was finally located but there is speculation that some survivors did “integrate” with local aboriginal groups, as they have some non-indigenous characteristics (tallness and baldness) and the local language and place names have some Dutch elements tp them (Gn at the start of place names), and these are the only aboriginal groups known to have farmed rather than collected bush tucker. 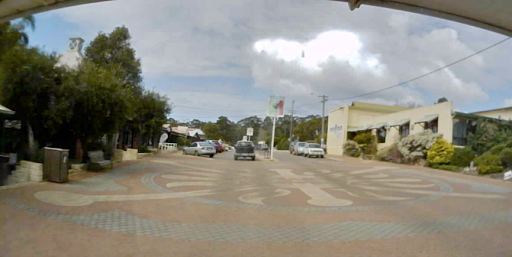 The route down the coast was extremely windy and we were blown sideways across the road several scary times so we went inland a bit through Margaret River, a very touristy town, aiming for the Warner Glen campground on the Blackwood River. However the road to it was closed, due apparently to the bridge having fallen in the river only 2 weeks after the council engineers pronounced it safe. Egg on face time in the council since they can’t fix it until spring when the water level drops and even then it will take 9 months. The locals are not happy. Bummer, so we backtracked to another very nice camping area on the same river, near the old Alexandra Bridge. It was raining again and surely the ranger wouldn’t come out on a cold, wet and windy night like this to collect the fees would he? Well yes, actually he would. A warmer calmer start to today, but we were still late in breaking camp. Augusta and the Cape Leeuwin Lighthouse were today’s objectives but first we ventured out to the windswept coast at Hamelin Bay. 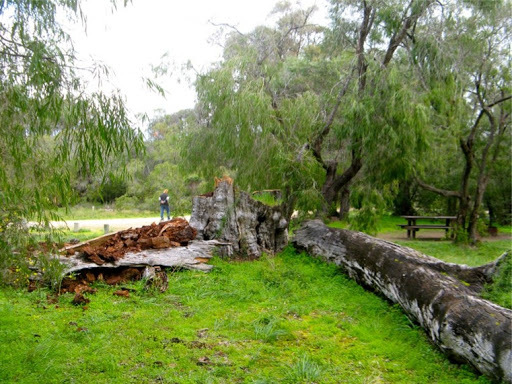 This was the location of the first international export hub for local karri timber to the England, South Africa and India, although little of the jetty still remains. 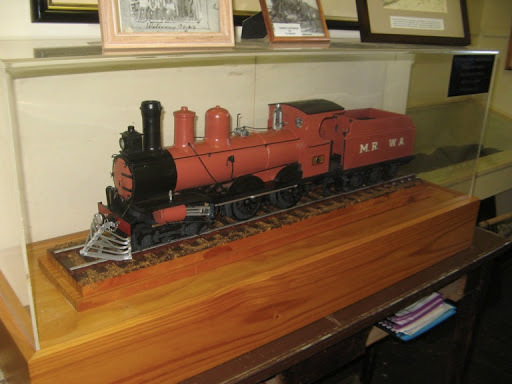 Augusta is a very pleasant town situated on the sheltered lee side of the Cape on the banks of the Blackwood River. However no photos were taken because it was now lunchtime. 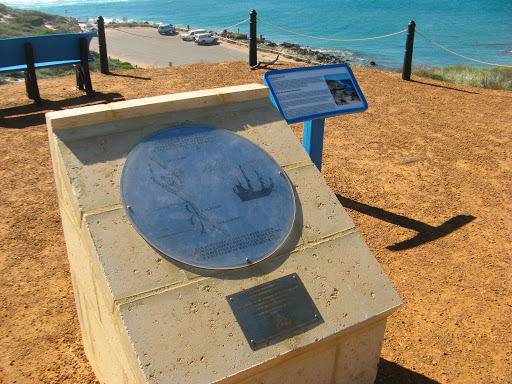 It was near here that Matthew Flinders sighted the Australian mainland for the first time in 1801 and a plaque marks this point. Luckily there aren’t plaques for every time he sighted the mainland or there would be wall to wall plaques all along the entire south coast. 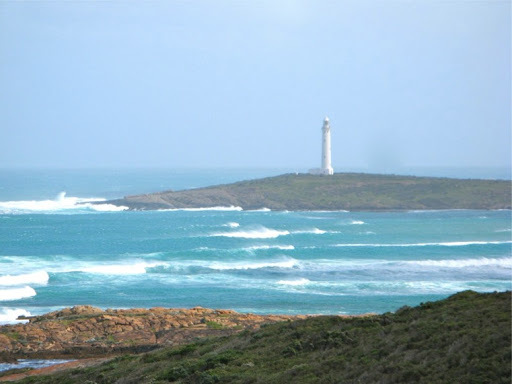 Sensibly he kept well out to sea as he passed by, as the Cape Leeuwin lighthouse was still 95 years in the future and the bay is littered with rocky reefs. 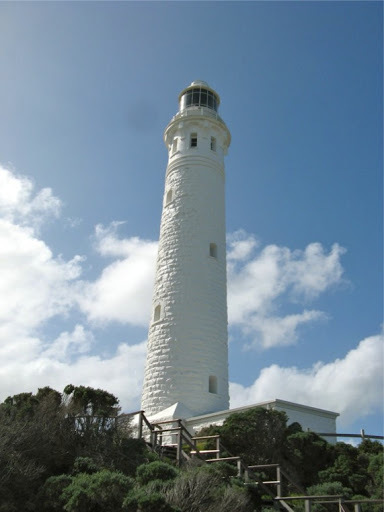 We visited Cape Leeuwin lighthouse in 2003 while bringing our Oka back to Adelaide but I couldn’t spell it back then. It is still a most impressive building being 56m tall and still in daily (nightly) use. The 4 lighthouse keepers who lived in these cottages were reduced first to 3 and then to none at all as economics and automation took their steady march forward. It’s called “progress”. 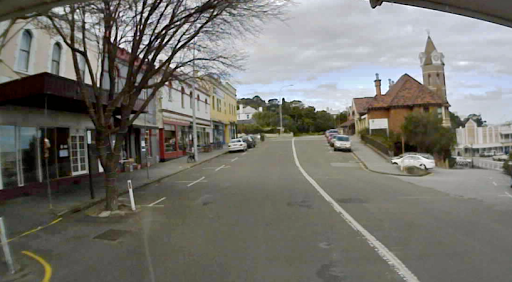 At 2.07pm exactly, Admiral Shopkeeper (or he may just have been the volunteer counter staff, but he did wear blue epaulettes), came out just as I was passing and ran the Aussie Flag up the flagpole while I videoed the procedure. I probably should have saluted. Intrigued, I asked him the significance of the timing of the flag raising ceremony and he said “it was too bloody windy earlier” and then added “yesterday it wasn’t done at all”. So environmental factors clearly override ceremonial etiquette. Best time to invade Oz? When it’s blowing a gale and the Navy is inside watching “Neighbours”. The identity of the flag runner upper has been blurred out of this photo, partly to protect the guilty and partly due to finger trouble on the part of the cameraperson. 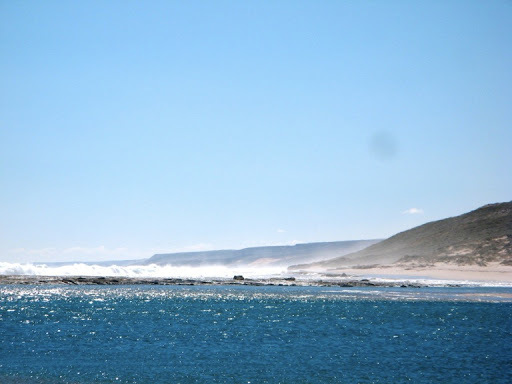 The sea around the cape is where the Indian and Southern Oceans meet, in a huge conflagration of tides and currents. Not the place to try out your new surf ski, or to land and claim a new continent for the Crown. Capt. 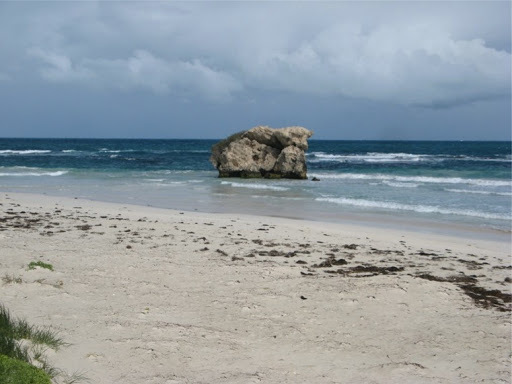 (Lt. as he was then) Cook had already done that 31 years earlier, in 1770, on the safety of a tiny uninhabited coral island of the west coast of Cape York which he called Possession Island. It was a big stretch of arrogance to claim a small coral island in the name of the Crown, oh, and while we’re at it, also the big one next to it. 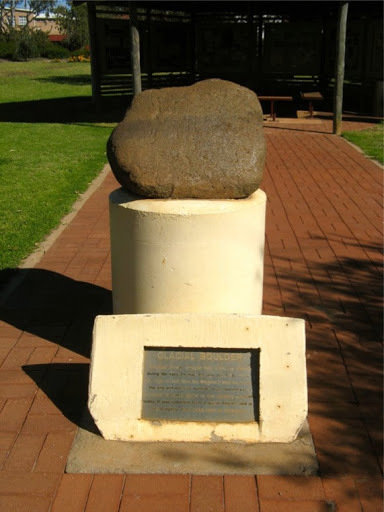 On an historical note, both the Dutch and the French claimed Australia (New Holland) as their territory by leaving notes to that effect on islands off the west coast of Australia but their claims weren’t found until centuries later and were never enforced so the English just took possession anyway. 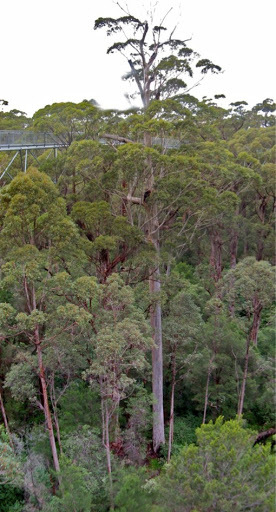 Later the same day we drove thought the Boranup Forest of immensely tall karri trees (Eucalyptus diversicolor, not to be confused with the kauri pine of NZ). We located 2 other forest camping areas on this drive but, because the road east to Pemberton was the same road that last night’s campsite was on, we decided to return to last night’s campsite. And we did! Monday and it’s not raining or windy. Make a note of that. 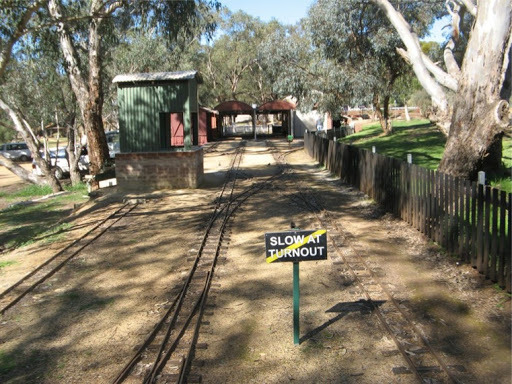 Pemberton was reached by taking a wrong turning to Nannup rather than the direct route. 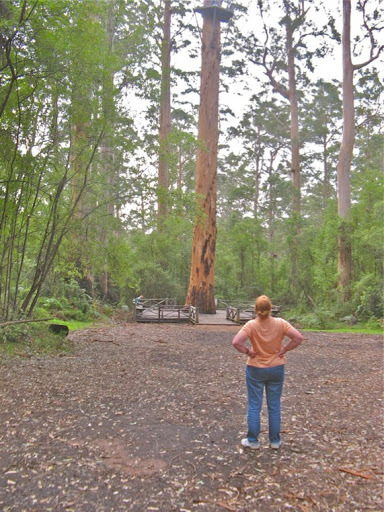 Anyway, it was a nice drive though more karri forests and it did lead through the Warren National Park where the Dave Evans Bicentennial Tree is to be found. Not so bad from this range. 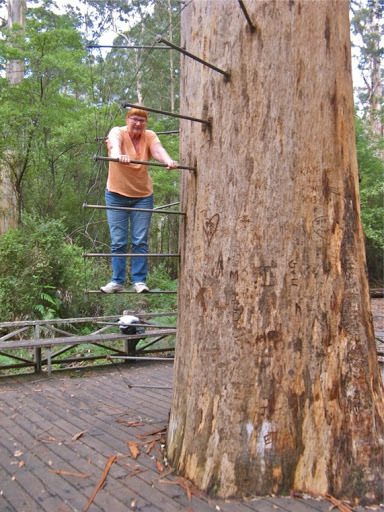 But this is a 75m high karri giant, adorned with 130 steps made from reinforcing rod hammered in a spiral fashion around the trunk and up to viewing platforms, the first at 25m and the last at 60m above the ground. There are no overtaking zones and the platform at the top weighs 2 tonnes and sways +/- 1.5m in a breeze. 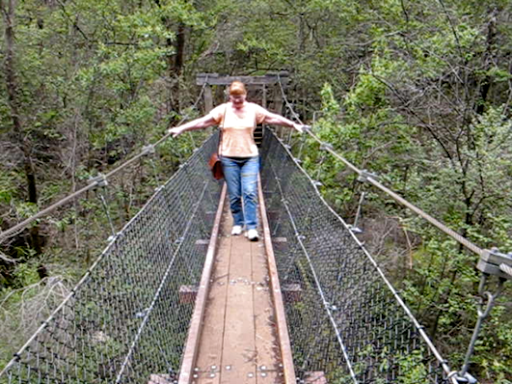 Since this was the gravitational opposite of bungy jumping we stayed on terra firma. Well almost, Janet reached the 2m point before declaring it a draw. The other 58m will have to wait until another day, and there’s not a lot to stop you sliding between the rods with wet sneakers on. I also reached 2m and coming down backwards was even worse than going up since you have to look down to find the next step, which is behind you. 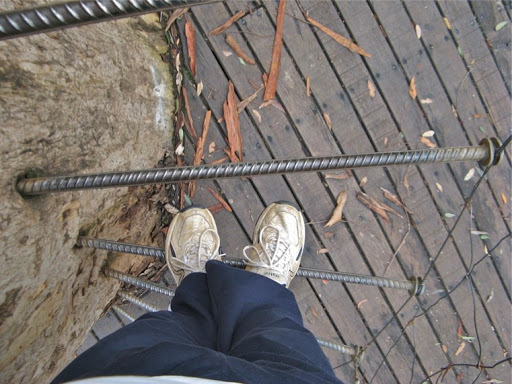 My greatest fear was not going up and down, but someone slipping off high above and me having to act the hero and climb up and rescue a panicking body from slippery steps half way up a wobbly tree. My nightmares are now set in place for several weeks. 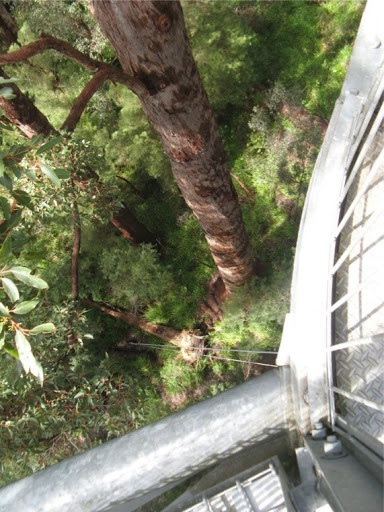 If you do make it to the top, this is the likely view whilst awaiting rescue from your panic attack. 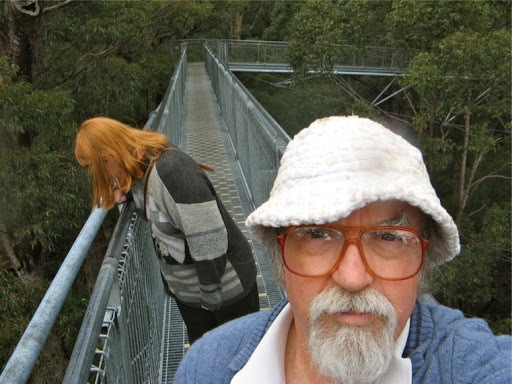 Prior to The Tree, we visited the Beedelup Falls where I had another Oh Sh*t moment. 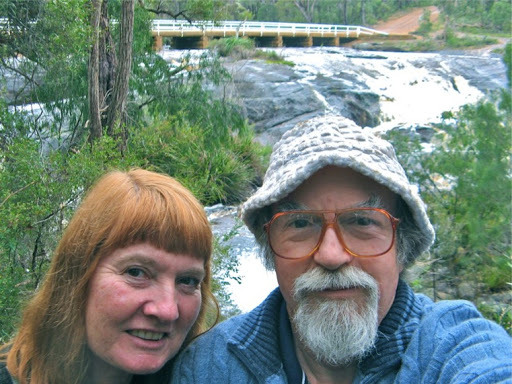 The falls were quite nice and J even negotiated the swaying suspension bridge without falling off. But on the way out of the squeezy car park, one rear wheel went over the kerbing and the back went down bang on to a rock. I couldn’t find any damage so I assume the rock hit the bottom of the wheel carrier, but the crashcam video recorder certainly recorded a loud bang, about 3 on the richter scale, and the Oka shook. Undaunted we carried on and nothing seems to be amiss. 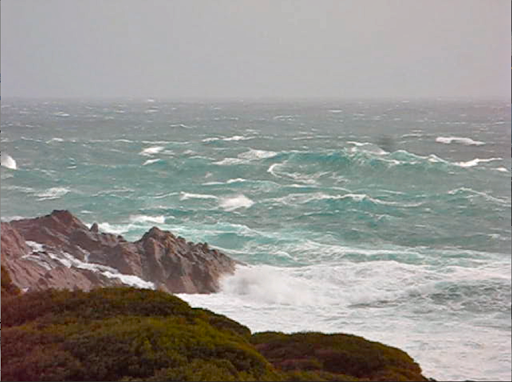 After refuelling at Pemberton, we set sail for Windy Harbour on the south coast in the d’Entrecasteaux National Park. 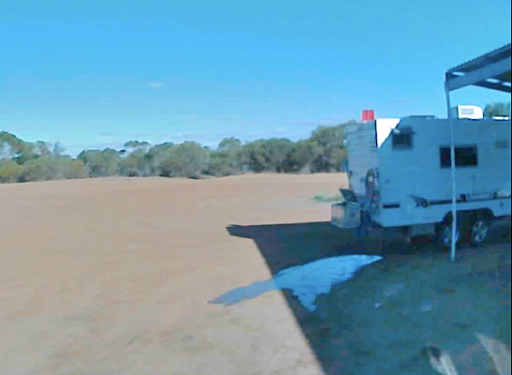 There are no campgrounds in this section of the huge park but the Windy Harbour community runs a small caravan and camping park which is quite nice, except recent rains have flooded 3/4 of it so finding a high dry spot is tricky. There are huge rivers and lakes of water all along the roadside from recent storms which is why we didn’t look for a semi-legal campsite amongst the dunes. One bogging per trip is sufficient. And I can also report that Windy Harbour is not at all windy today, it’s actually fairly warm, humid and calm. Kangaroo poo is all around us and at night the roos come out to feed amongst the campers, of which we were the only ones last night. We even did a bit of washing today, hung it in the warm sunny breeze and it mostly dried before we set off. Lucky really because the wheels fell off later on and it rained horizontally for most of the day and into the evening. Before leaving I noticed one of the front spring hanger washers had a clean area around it. That was not expected, it shouldn’t move. So I got my big wrench out and tightened the nuts all up. A couple turned a full turn, a few turned a bit and some were quite tight. The steering feels a bit more positive now. I had to put some mats down to cover the kangaroo poo and Janet had to clean roo poo off her sneakers. 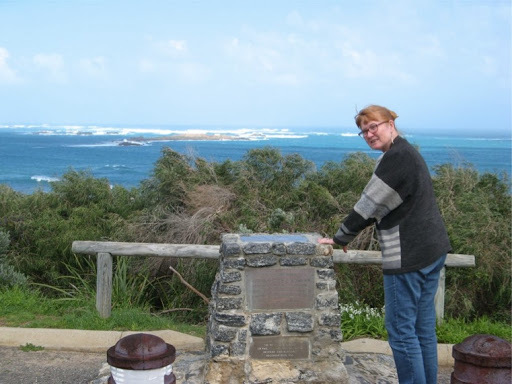 However we did get to see Windy Harbour from the point at Cape d’Entrecasteaux. 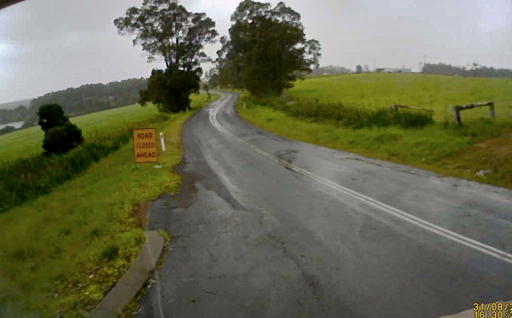 After backtracking to Northcliffe we cut across towards Walpole through more karri forests as the rain started tinkling down. 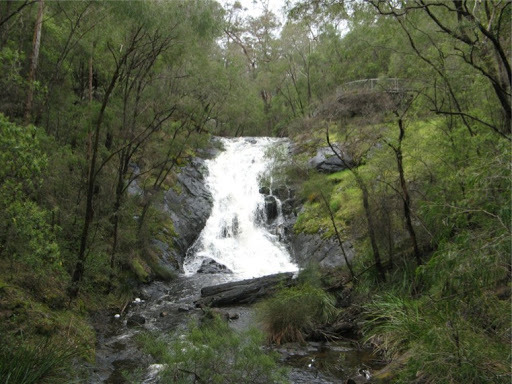 Along one of the forrest tracks is Fernhook Falls which we just fitted in between showers. 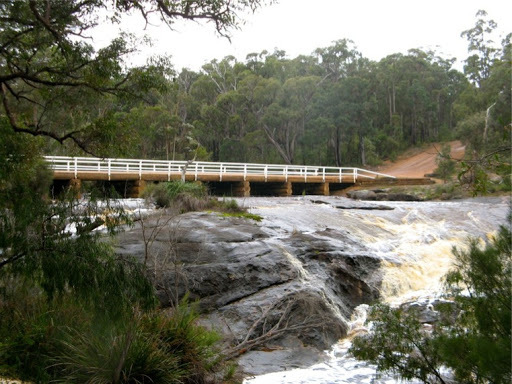 Across the nearby Weld River is a good example of karri log carpentry in the form of a sturdy timber bridge. 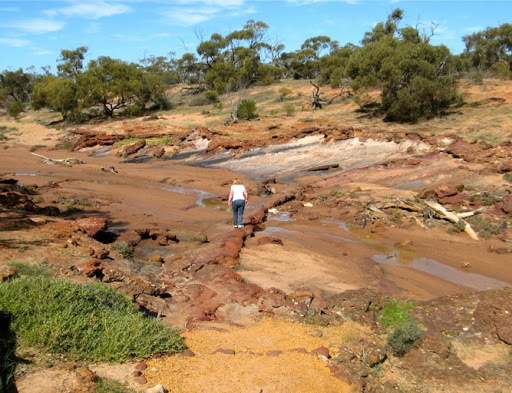 And although the Sandgropers wouldn’t like the comparison much, this part of WA is very reminiscent of Tassie, probably due to the rain, the copious number of water features, and the brown tannin stained water. Their trees are about the same height as well. As the rain pelted down we sought out some camping possibilities approaching Walpole. 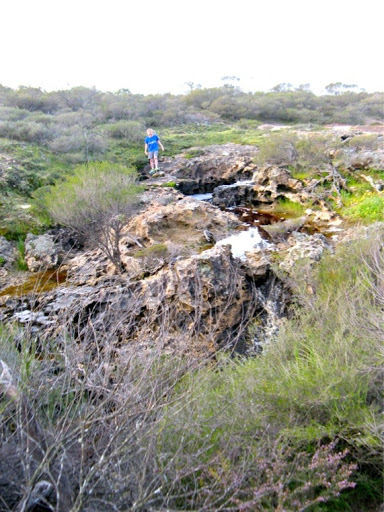 One was Sandy Beach, actually in the Walpole-Nornalup National Park. This is Sandy Beach, probably a superb swimming and sun baking beach at the right time of year, which this is not. There were no No Camping signs in the car park but we know it’s not allowed. We were intending to stay there anyway but something spooked me about the location. There was a caravan park nearby, very wrongly called the Rest Point CP because the sign looked deceitfully like a rest area sign. The grassed areas were mostly underwater from the rain, surprisingly, so weren’t interested in that, but we would have been seen checking it out. 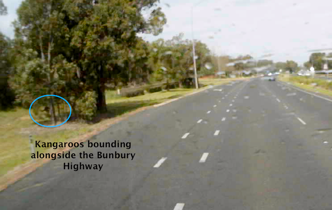 Then, while we were parked 3km away at Sandy Beach, a couple of blokes in a ute with nothing in the back came up and stopped alongside us, then they moved in front of us and parked again to look at us. A few minutes later they left, tooting us as they went. It may just have been a friendly goodbye or they may even have been admiring the Oka, but why would 2 blokes come down to a deserted beach when it’s absolutely persisting down with rain and just look at us? 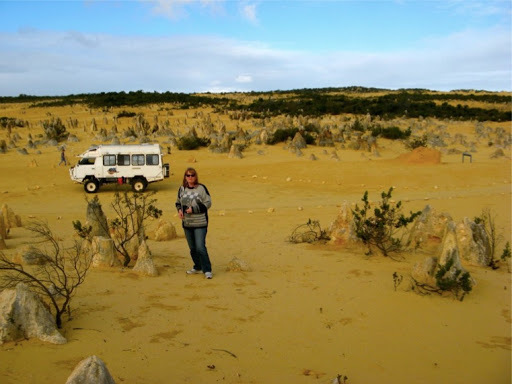 I was suspicious, so we moved out and backtracked a few km to the Crystal Springs campground on Mandalay Beach road in the d’Entrecasteaux NP. 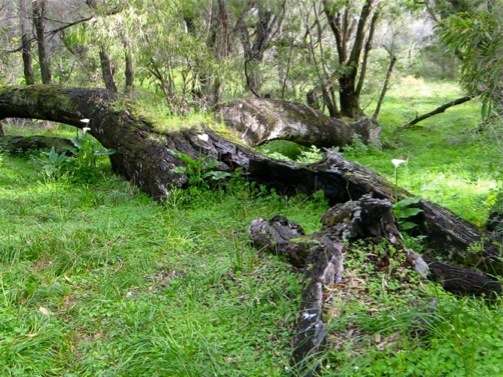 It’s not on the beach, miles from it, but in a grove of leaning green moss encrusted trees. Upside, a legal picturesque campground with facilities. Downside, no phone coverage and I had to watch the roof amongst the trees branches. 3 course dinner tonight: Pumpkin soup from pumpkins carried 7000km from our garden at home, left over cottage pie and veggies, custard/yoghurt with jam (all the bananas have gone). Plus a few glasses of plonk. 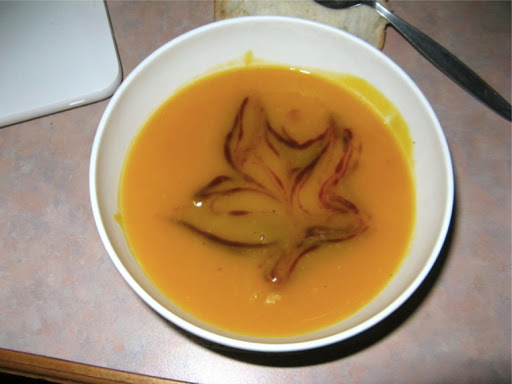 As an artistic touch I drew an orchid in my pumpkin soup using HP sauce. Rather good I thought? Would have been my grandma’s 131st birthday today. Her 103 years of life encompassed the industrial revolution, Victorian splendour, horse-drawn carriages, the oil industry, the motor car, several world wars, radio and TV, space travel and the start of the computer/mobile/internet age, probably the largest rate of change in anyone’s lifetime ever. She always said there were more stars around when she was a girl so she must have seen the expanding effects of air pollution as well. She also said that stones grew after rain, which is true when you think about it. It rained for much of last night as well but is now a sort of sunny, cloudy, drippy, rainy morning. 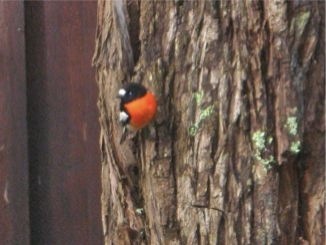 A crimson chat joined us for breakfast. Walpole was visited for a short time for IGA supermarket supplies and a look around the visitor centre at all the Chinese made trinkets. 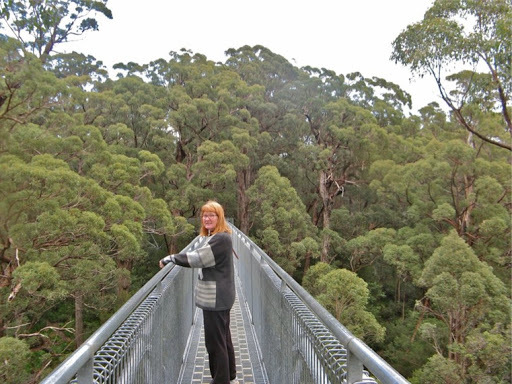 Then we headed east to the Valley of the Giants and the Tree Top Walk. 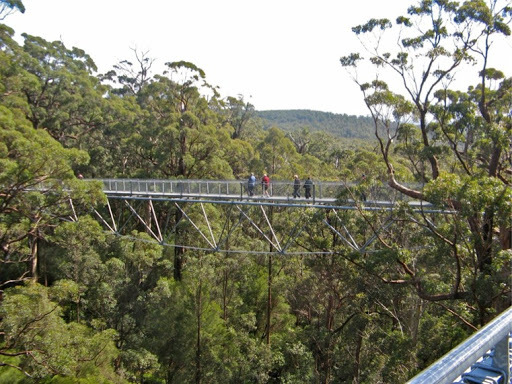 $9 each for being scared nearly sh*tless wasn’t too bad and we did go around twice as we got used to the swaying gangways, 40m up in the treetops. Just joking, she was enjoying the view. OK if you don’t look down. 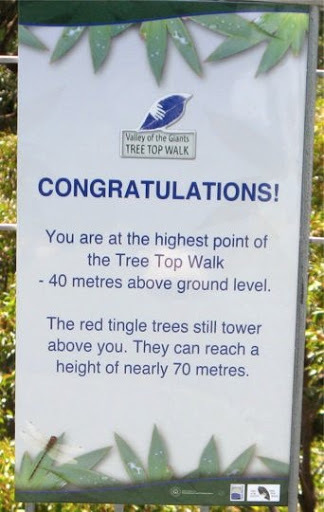 Back down on terror firma we gauged some tingle trees. This is a big one. Are you sure it didn’t move? And they have big roots. 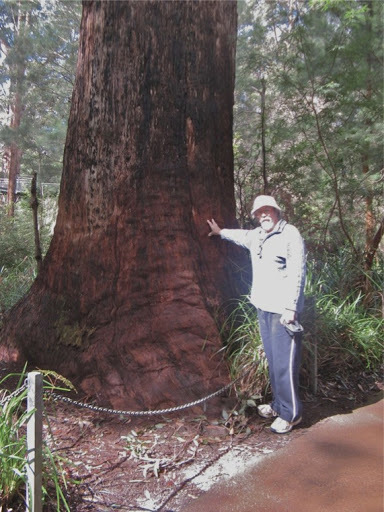 Because the Tingle Tree (Eucalyptus Jacksionii) is a seriously big tree. We had a peak at Peaceful bay which was peaceful but not very inspiring and then headed for a $10 campground at Parry Beach near Denmark which is run by volunteers. Glorious sunny morning as we headed east to the small town of Denmark not really expecting other than a nice view. Not only did we find a nice Laundromat, but we did the shopping while all the clothes were washed and dried, filled up with diesel and topped up a water tank at the same time. As we approached Albany, we were struck by its similarity to Wellington in NZ, with houses scattered on the hillsides. But somewhat smaller in size. 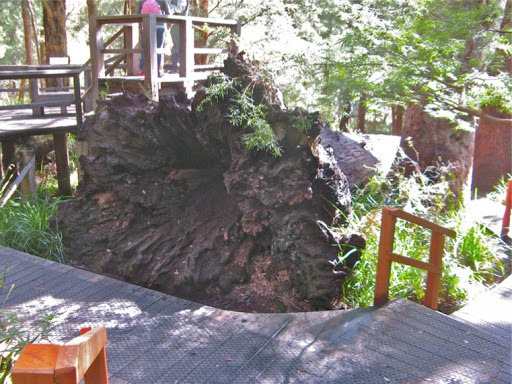 (Wellie in NZ for comparison). Near the docks are various museums to Albany’s past, good and bad. 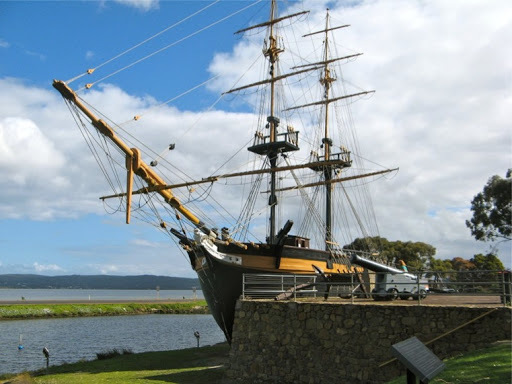 Albany was settled 3 years before Perth (Swan River Settlement) by settlers and convicts who arrived on the Amity, a brig which has been reproduced to the same design and using the same materials and constriction methods and rests in Albany harbour. 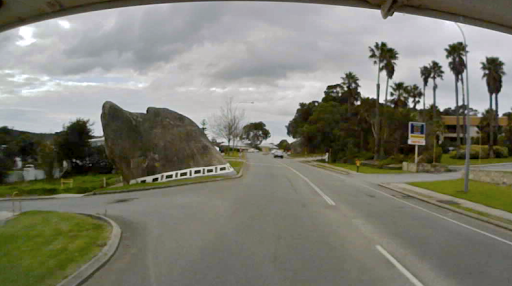 Albany is famous for it’s Dog Rock, a lump of sandstone which has the features of a Labrador and was unkindly sold to many unsuspecting US sailors based here during WW11. Albany’s many old building are still maintained and in use along the foreshore. After refilling a gas bottle at the difficult to find Albany Gas Centre (which is not central) we headed north to the Porongurup NP and stayed in a very good and inexpensive caravan park nearby since there is no camping in the NP. 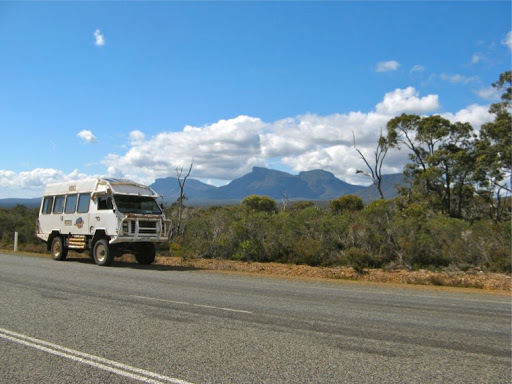 The view of the Stirling Ranges from Porongurup and our next destination going north. 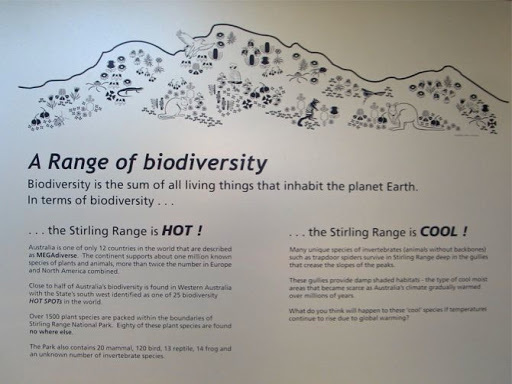 From Porongurup (I like saying that) we headed into the Stirling Ranges for a look and they are a most impressive range of mountains, sadly totally surrounded by farming land. 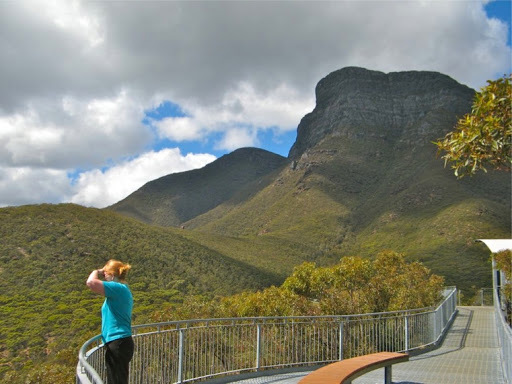 We drove up the very steep Bluff Knoll road to the car park, 250m above the highway to the start of the walking track to the summit. Mercifully we didn’t have the time, or inclination if I were being truthful, to take the next 1000m walk to the summit. So we just stopped to enjoy the views. This J enjoying the view from outside the toilet block where seats have been thoughtfully provided while you wait your turn. 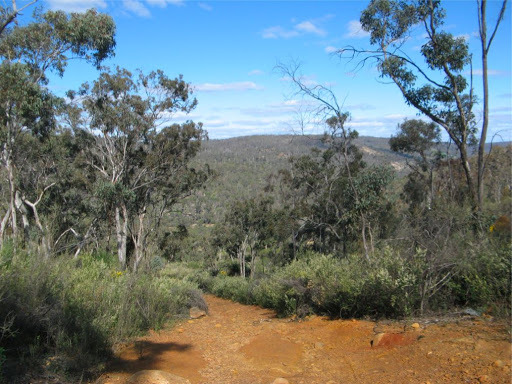 After lunch at 500m, we headed northwards through colourful farming land and nature reserves to Nyabing and are bush-camped just short of the town. Tomorrow morning an early start to complete the final 110km to the Oka gathering at Harrismith. There’s something odd about today but I can’t recall what it is. Ah, yes, I don’t have to do household chores today and I can have Vegemite sandwiches for lunch if I really want to. An early start today heading to the Harrismith gathering. More later, after the headache wears off a bit. 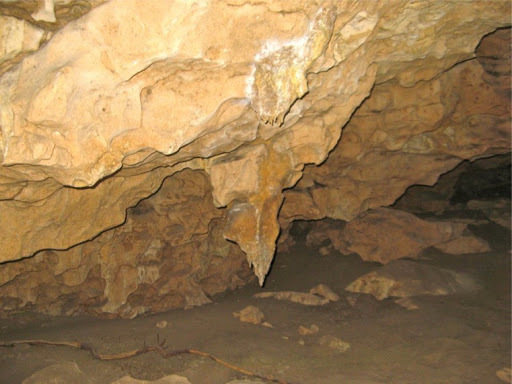 See new blog entry for the remaining trek.